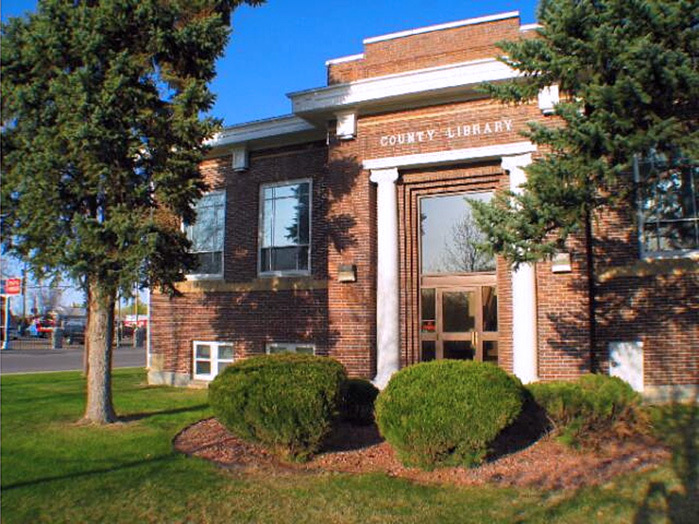 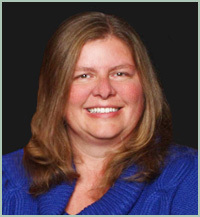 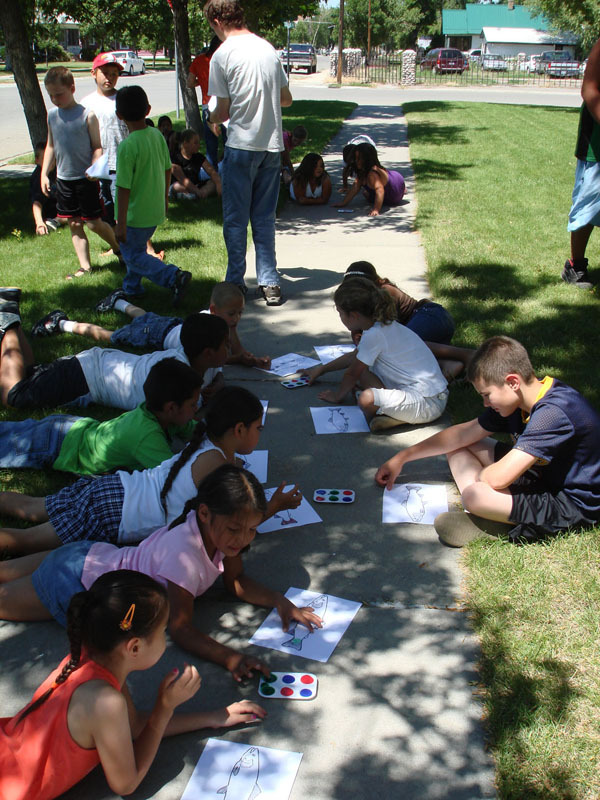 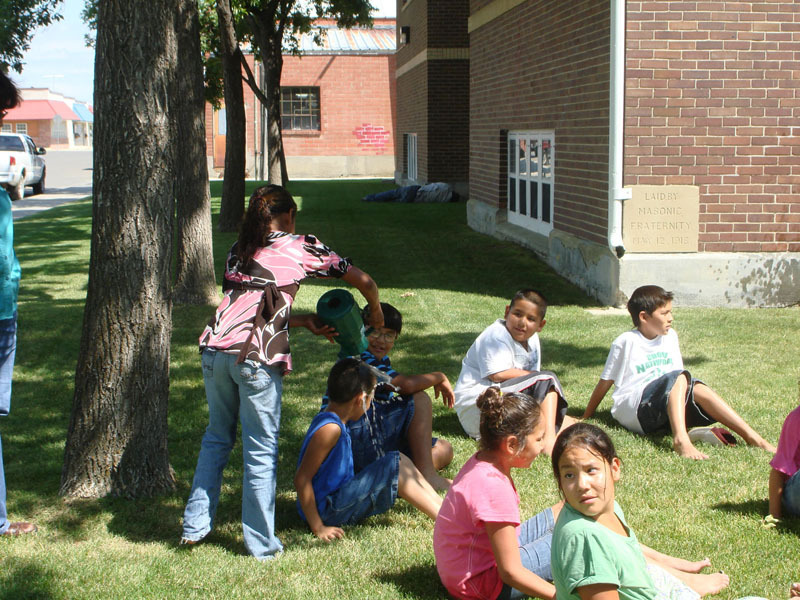 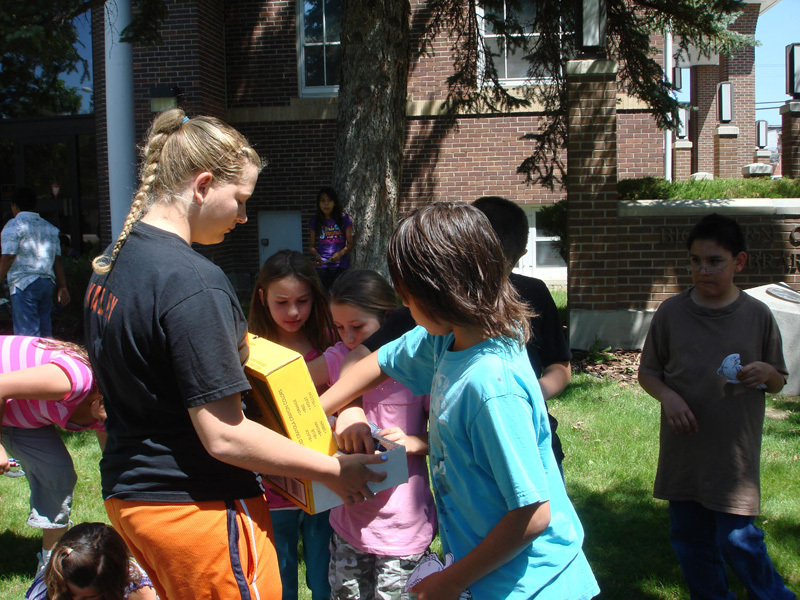 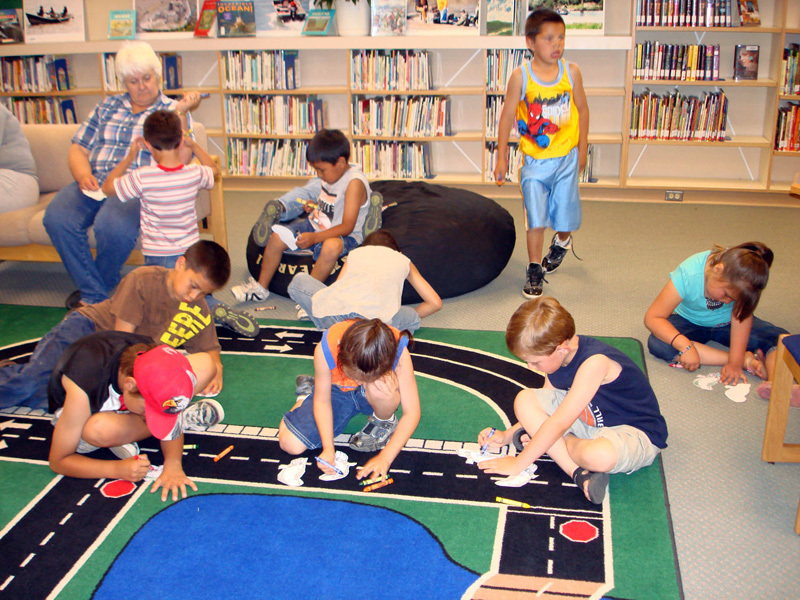 As the Children's Librarian for the Big Horn County Library in Hardin, Montana, Donelle Boyer plans the library's annual summer reading program which gives many children a safe place to go with activities related to reading to keep their minds active all summer. 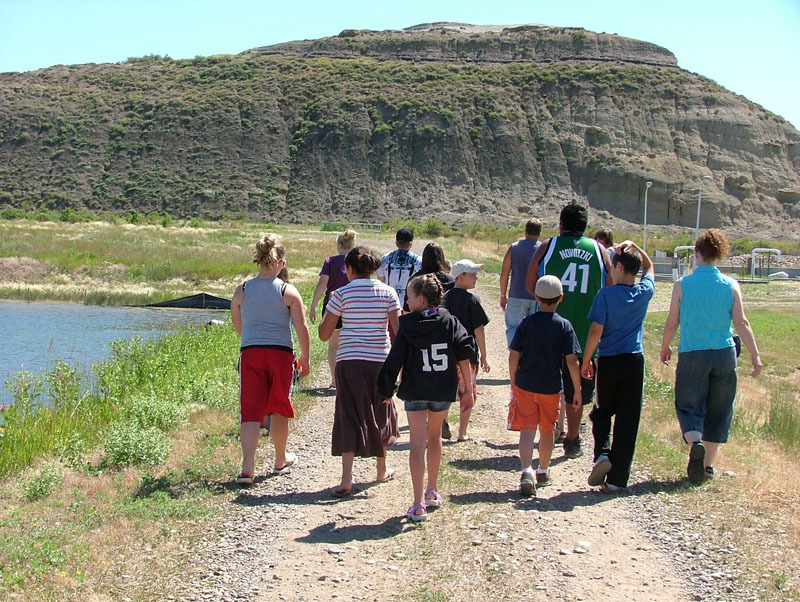 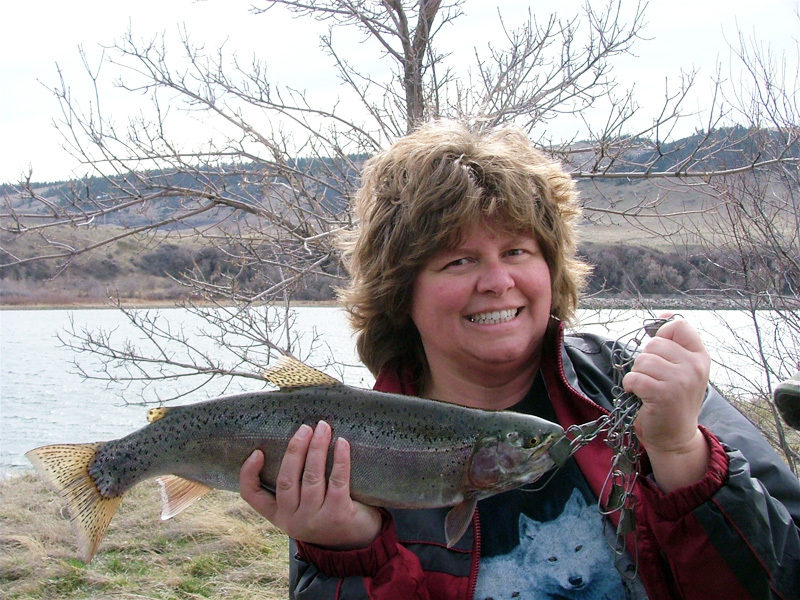 This year, Donelle is planning an exciting reading program which involves one of Montana's most beloved outdoor activities... 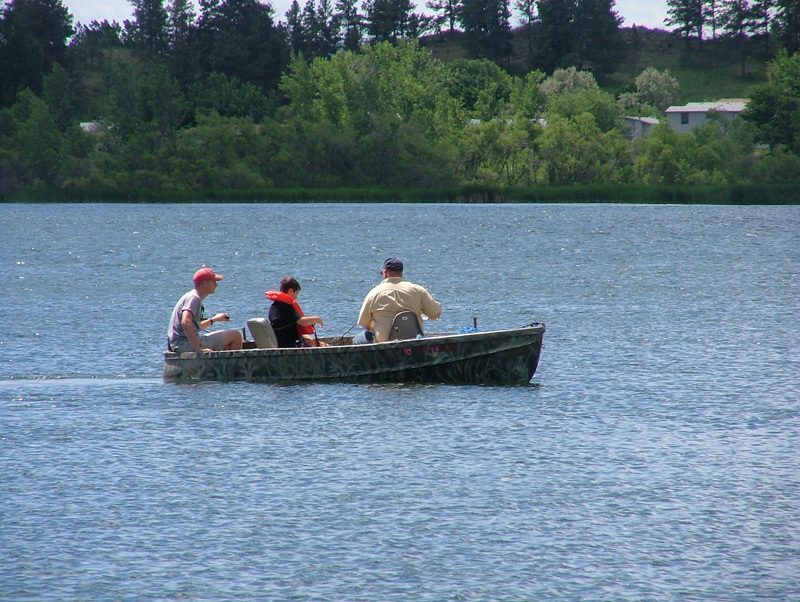 Fishing. 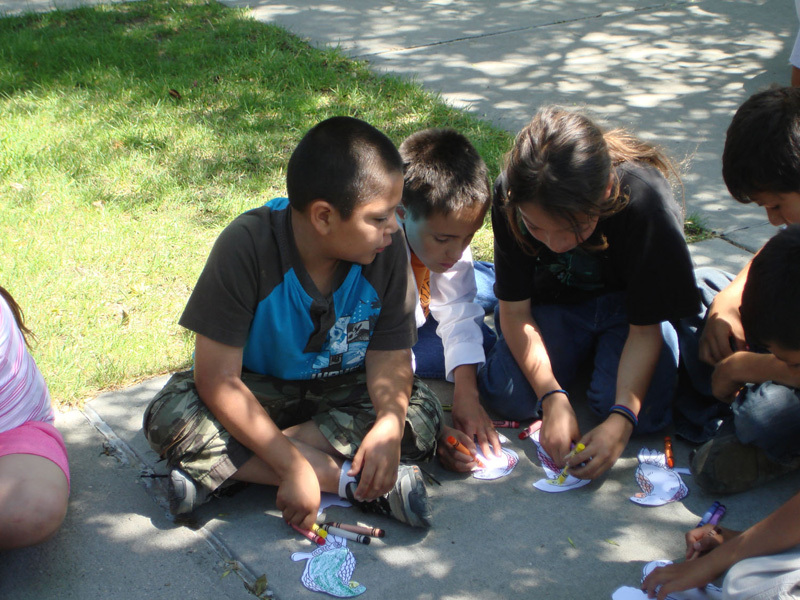 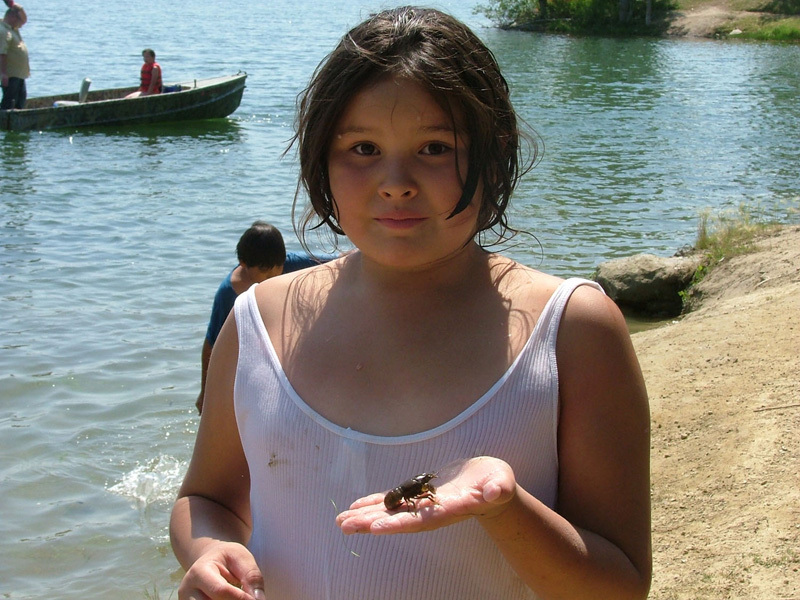 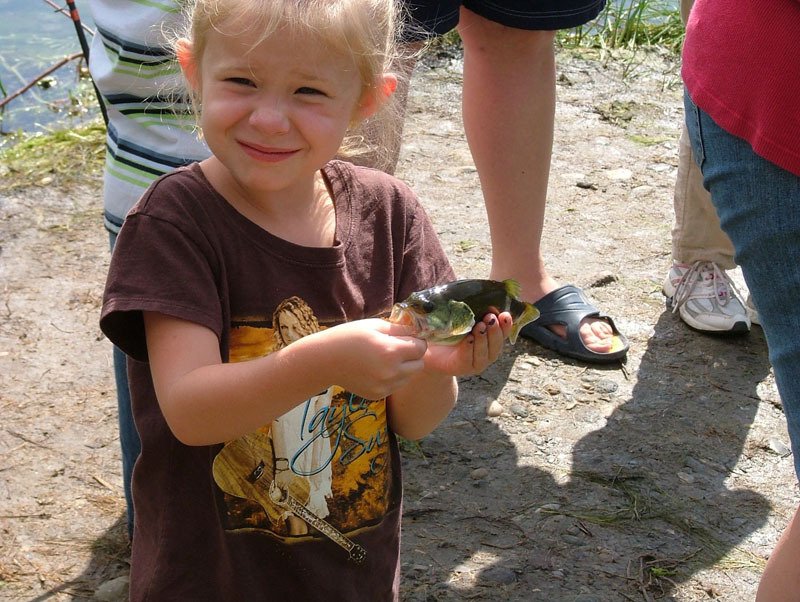 "Our MAKE A SPLASH, READ program will introduce kids to the lore of fishing and our lineup of fishing related activities will introduce them to the reality of tangled fishing lines, slimy worms and the one that got away," Donelle wrote on her application. 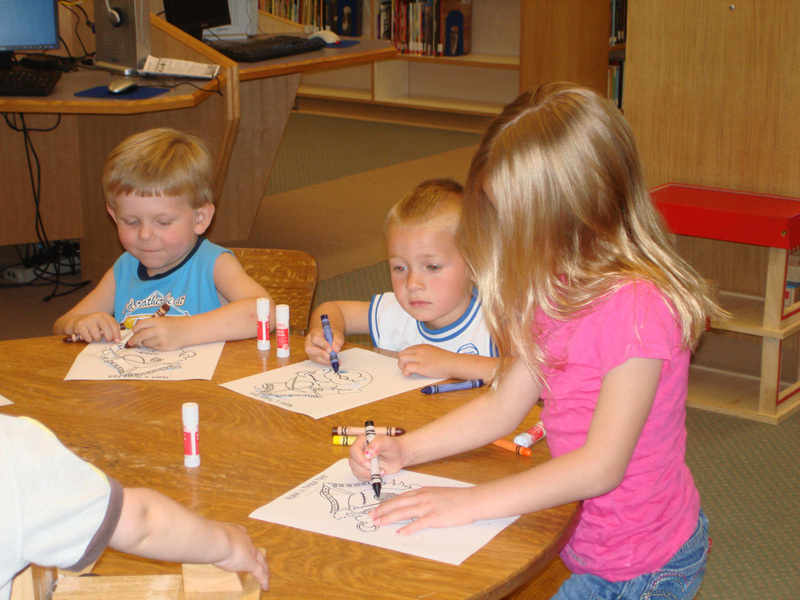 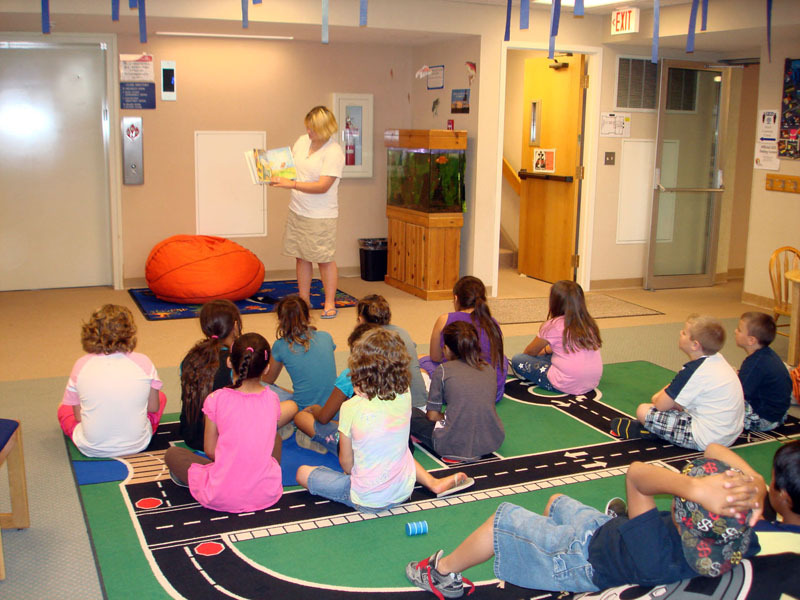 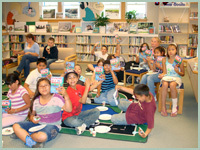 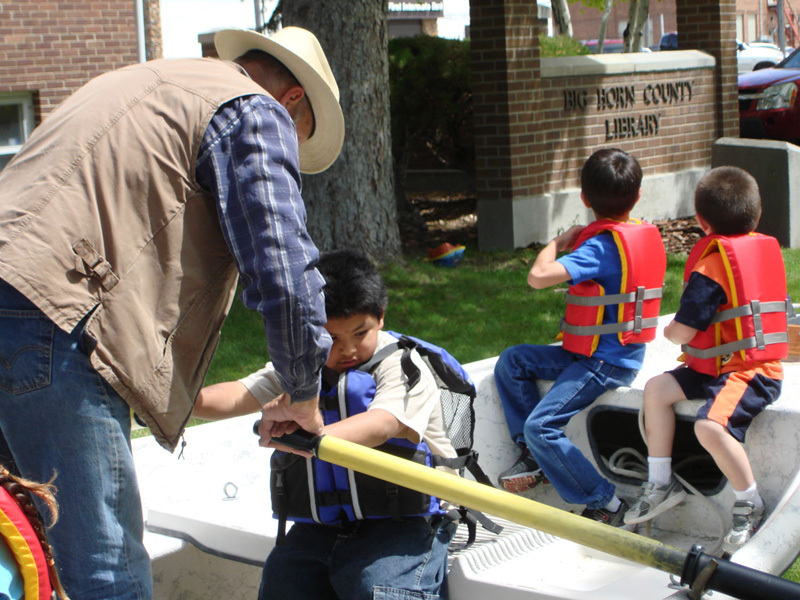 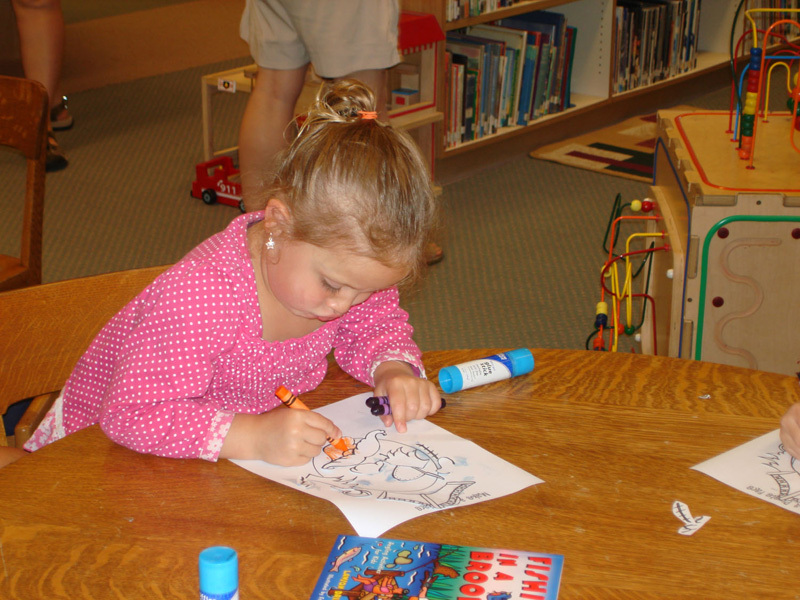 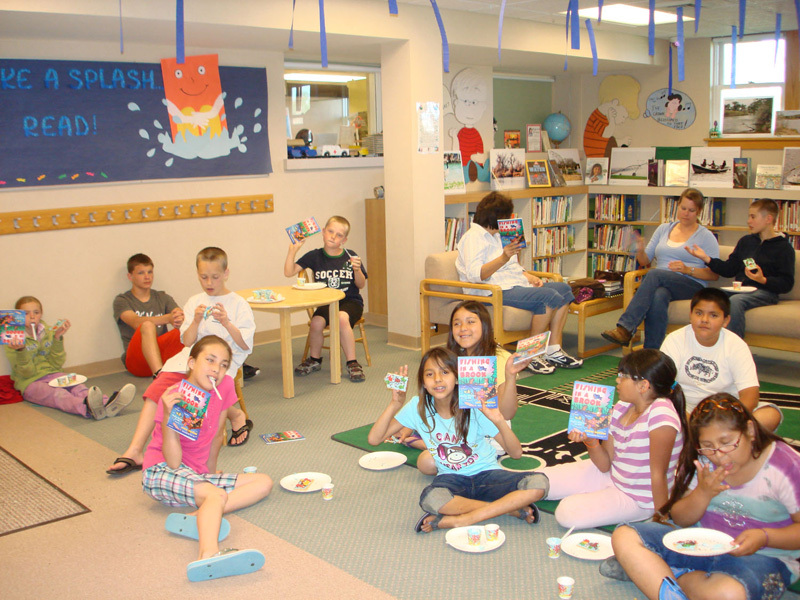 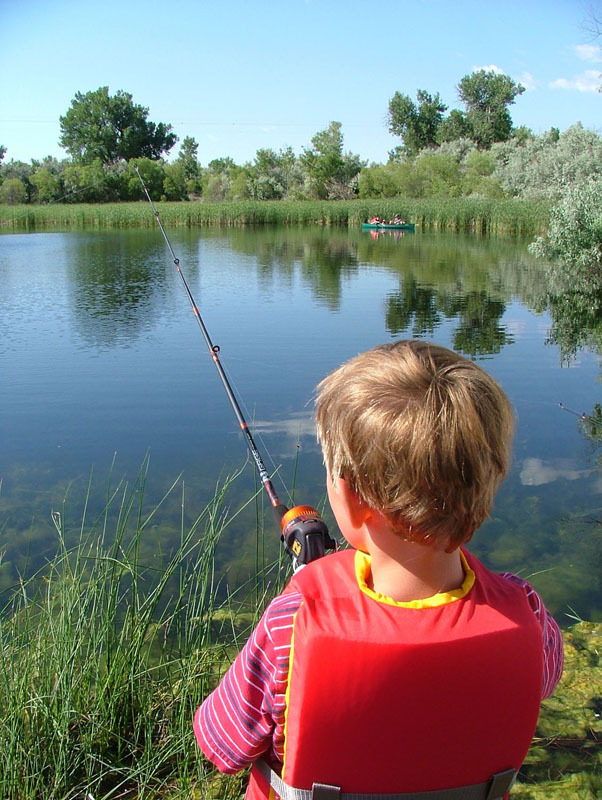 "By getting them hooked in 2010 we hope they will make library use a lifelong habit and sport fishing a lifelong activity." 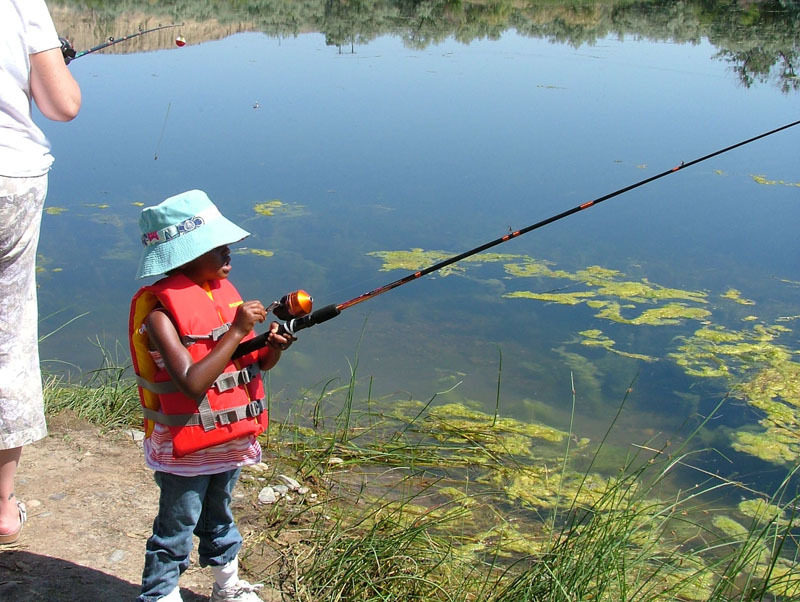 Donelle requested $2,000.00 to purchase 150 copies of the “Fishing in a Brook: Angling Activities for Kids” book for each participant, life jackets, fishing hooks, weights and bobbers. 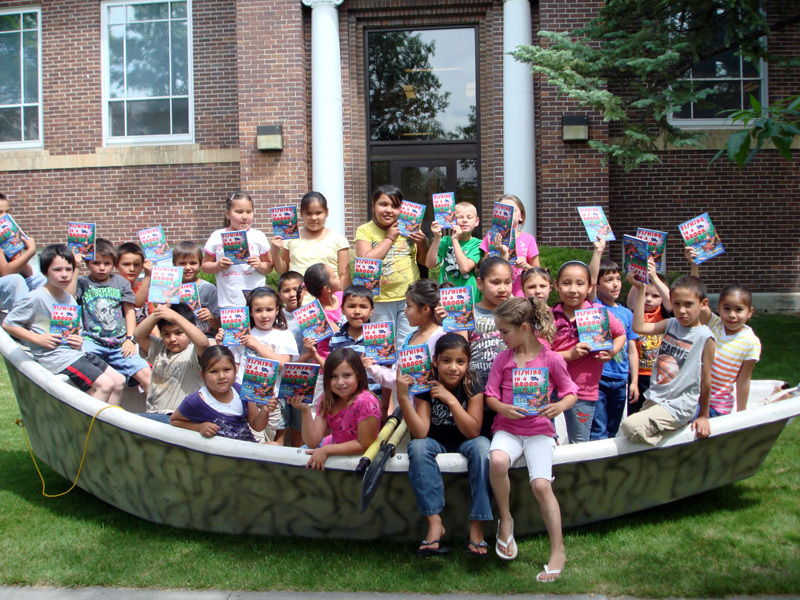 With the new books and fishing gear Donelle's summer program is sure to bring lots of free educational fun to local school children. 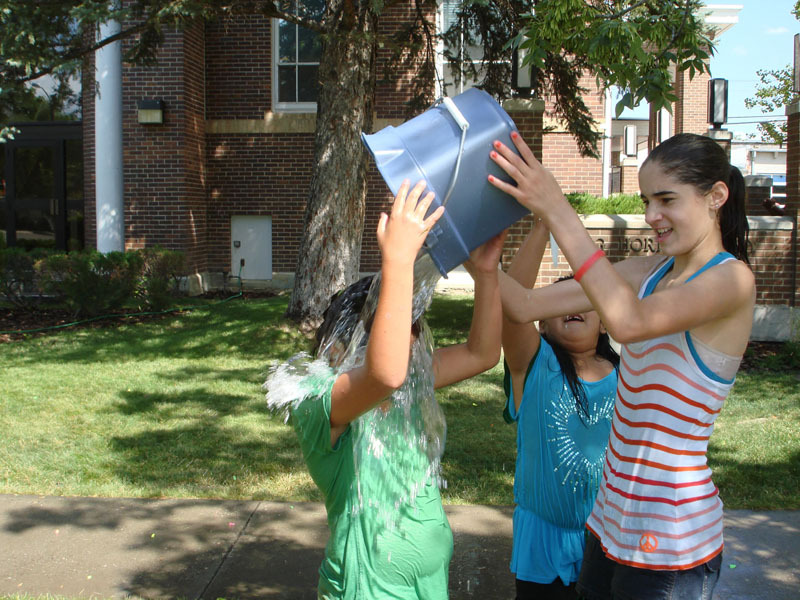 Donelle wrapped up the summer with a major splash! 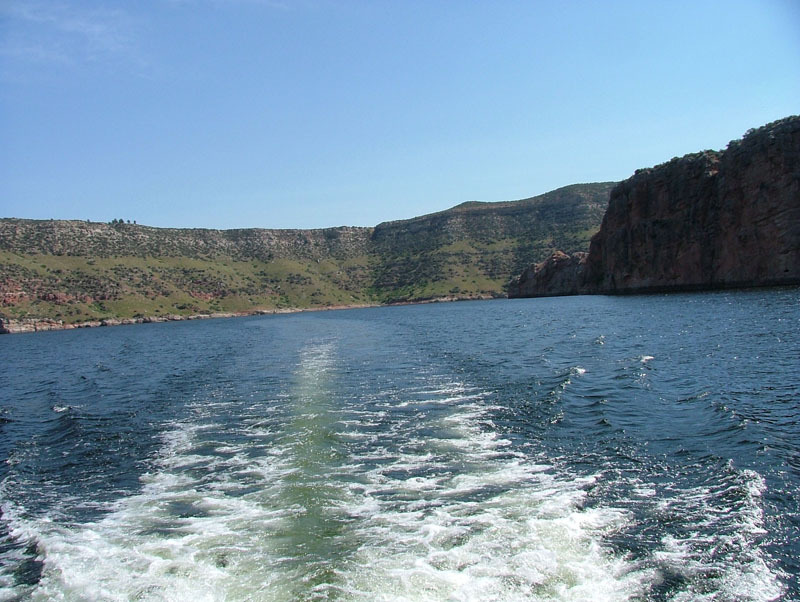 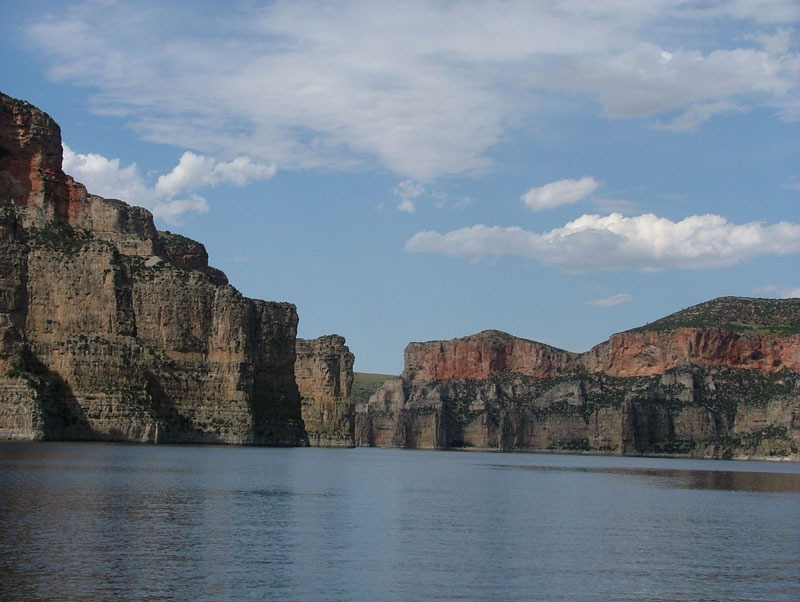 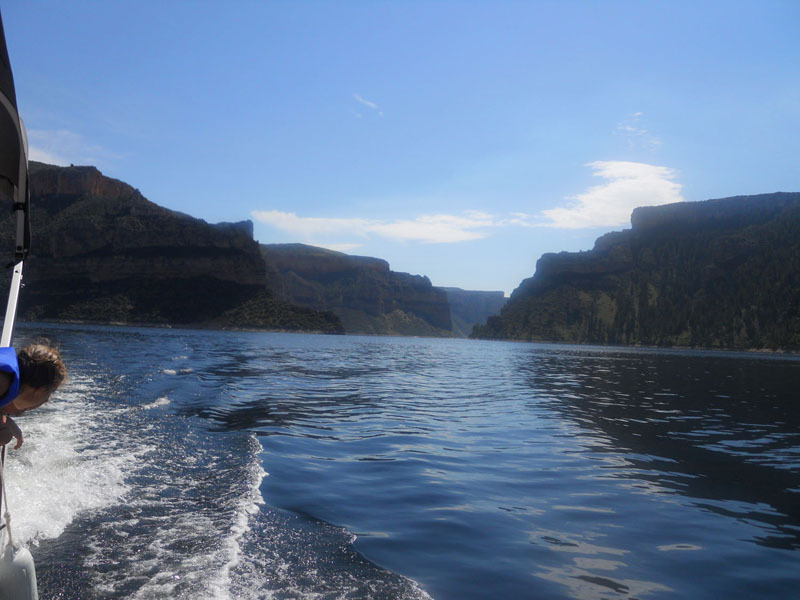 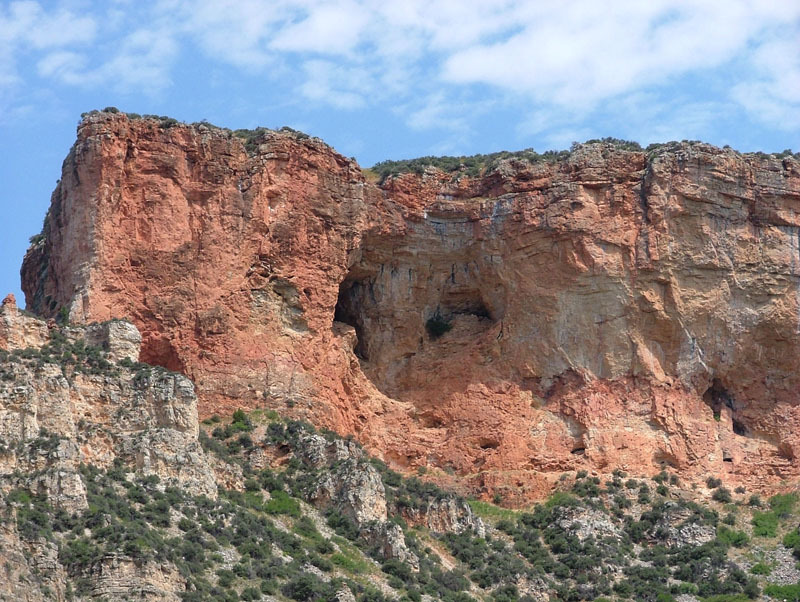 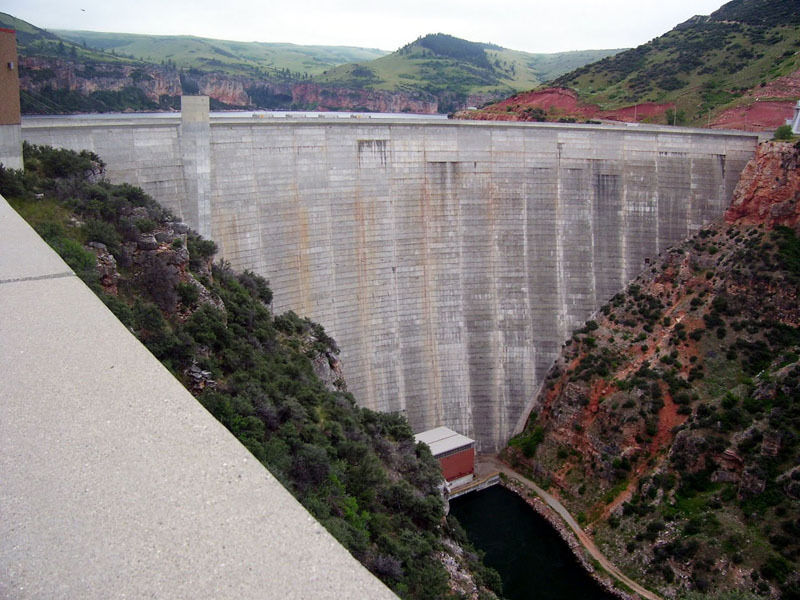 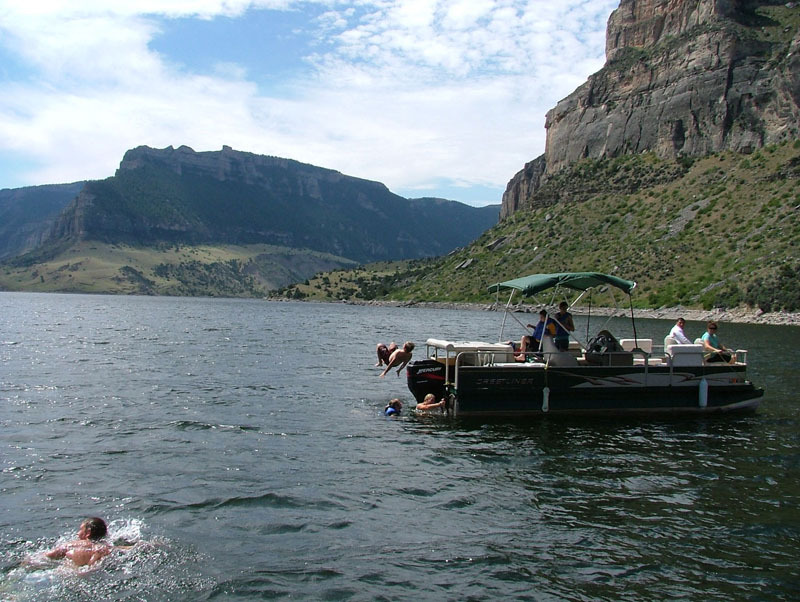 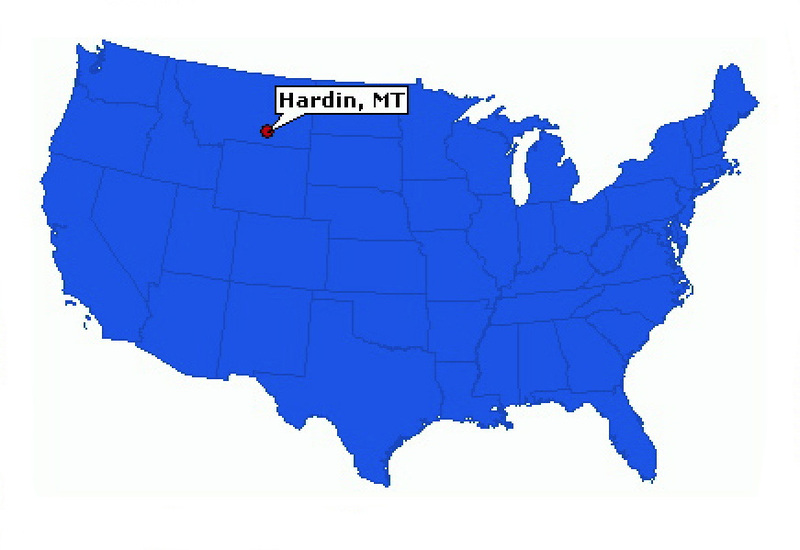 "I took a final group of participants to the Bighorn Lake (which is only about 50 miles from Hardin). 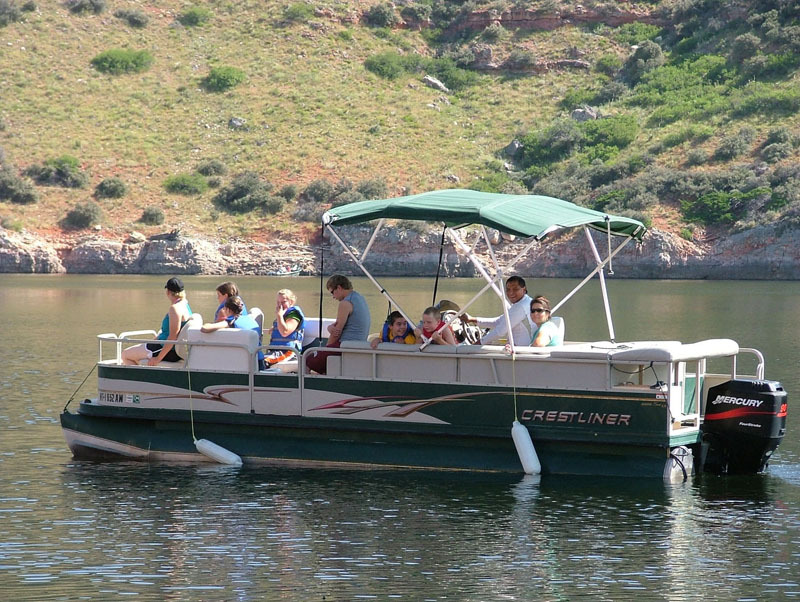 I had reserved two, ten man pontoon boats for the day. 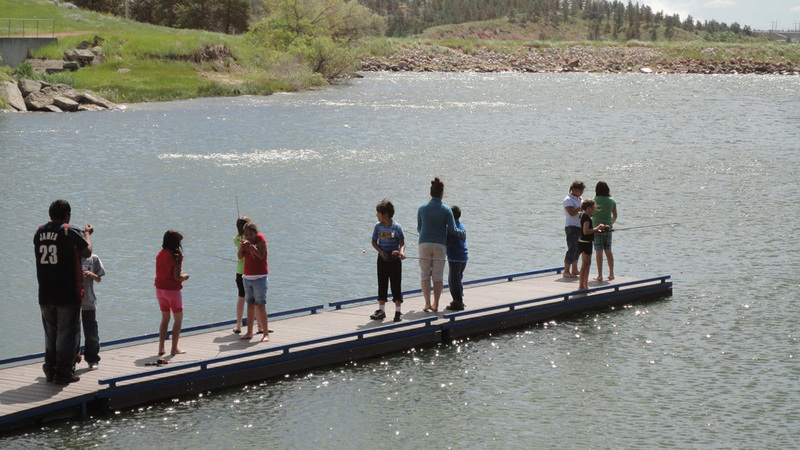 We took the kids about nine miles down the lake stopping along the way for swim breaks and a couple kids got out fishing poles to try and catch something big. 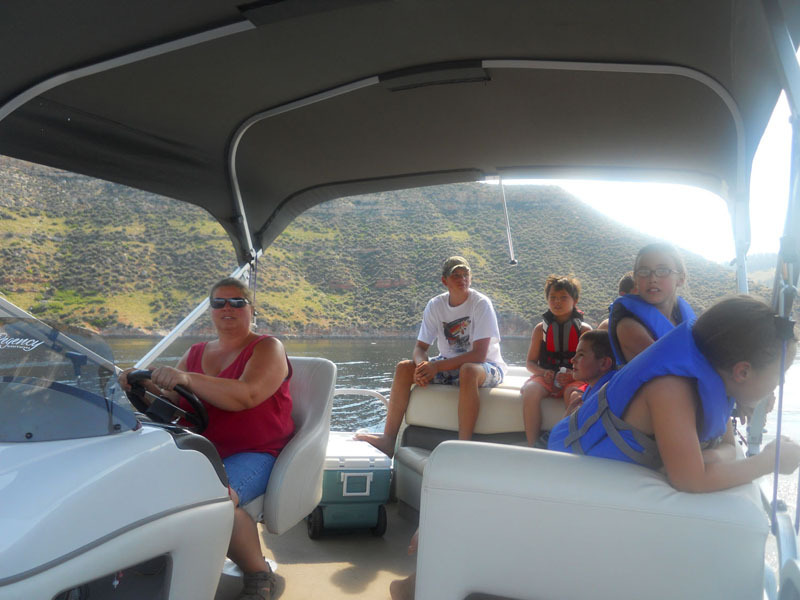 We stopped at a campground area only accessible on boat and had a picnic lunch. 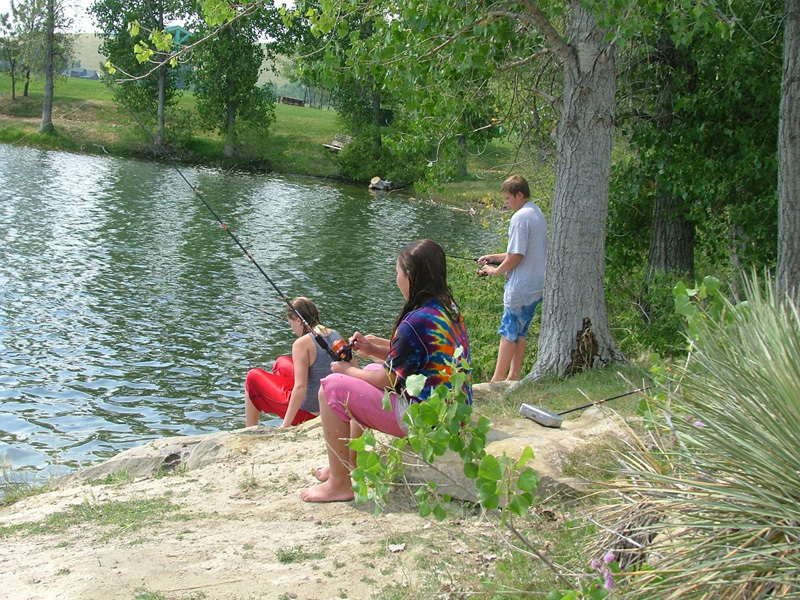 After lunch the kids went swimming, fishing, and caught crawdads. 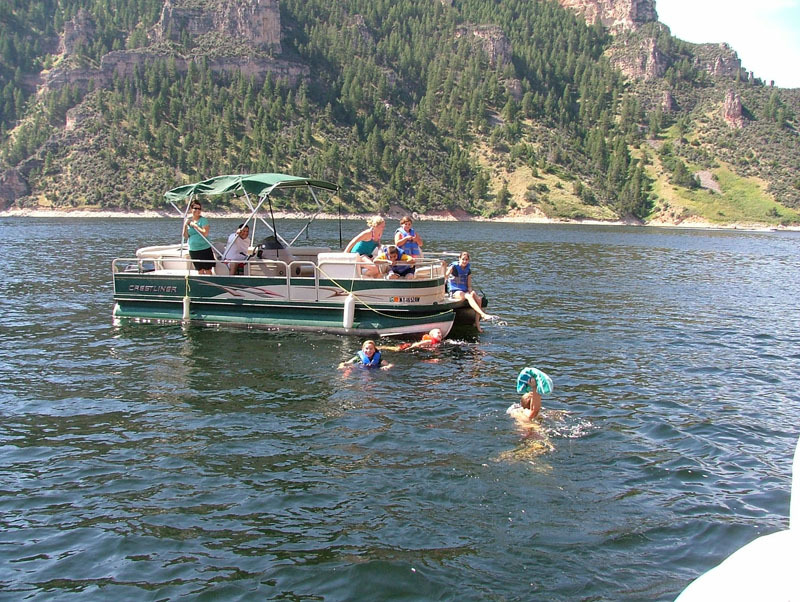 On the way back to the docking area we had to make more swim breaks. 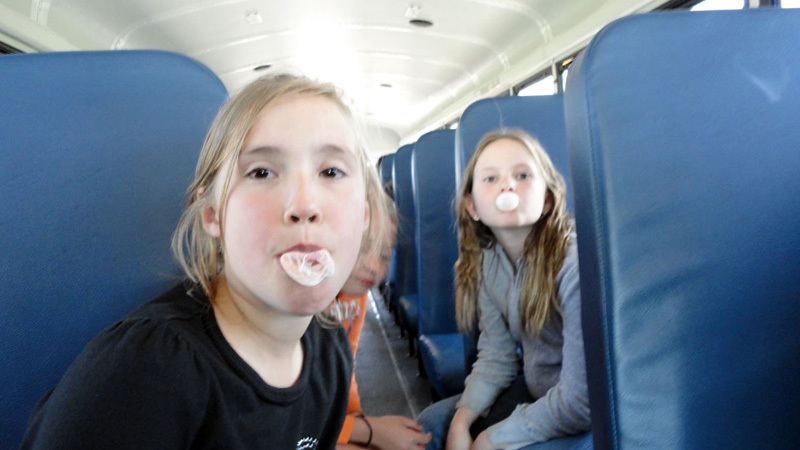 Kids and chaperones had a blast! 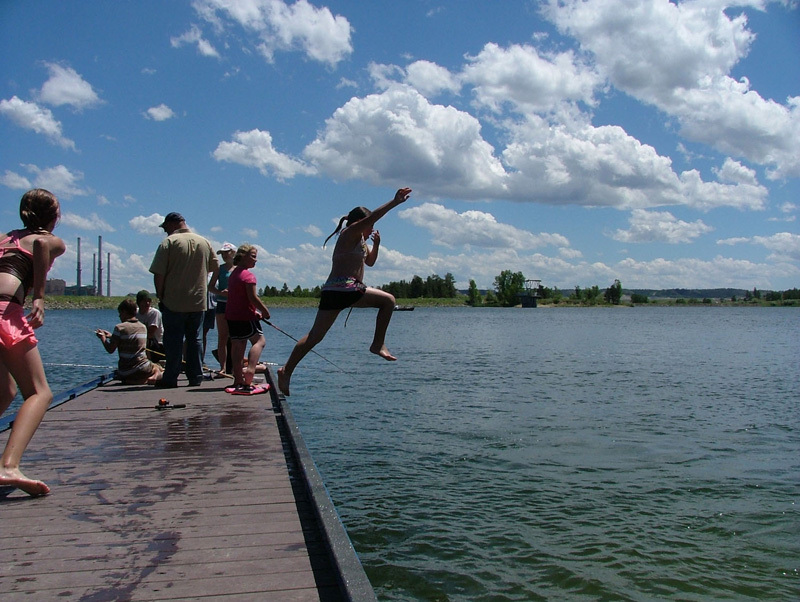 While I was finishing up on the boats the kids went swimming next to the docks. 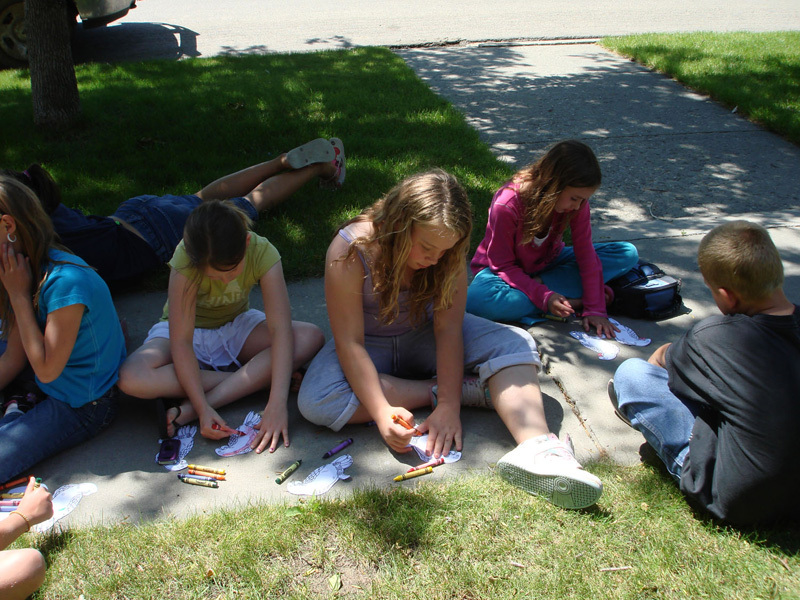 We ended our adventure with a fudge bar for the ride home. 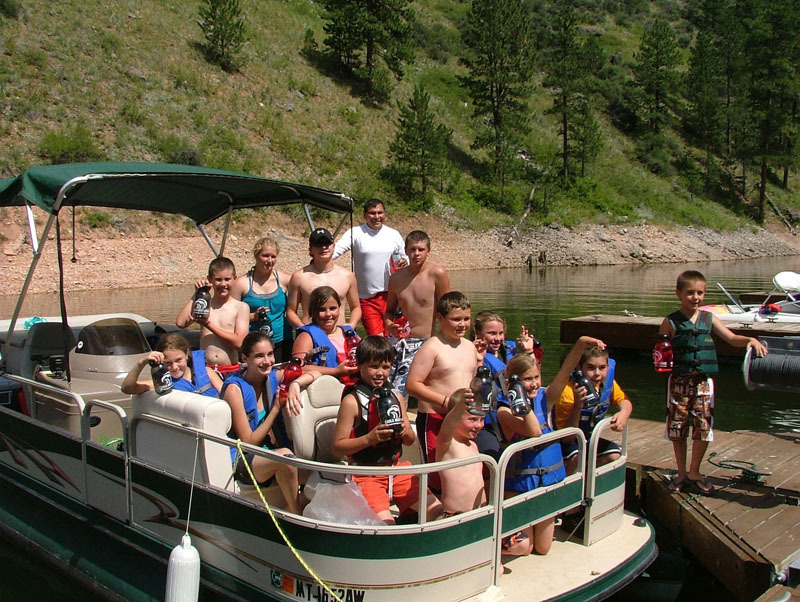 For some kids as well as adults this was the first time being on the lake. 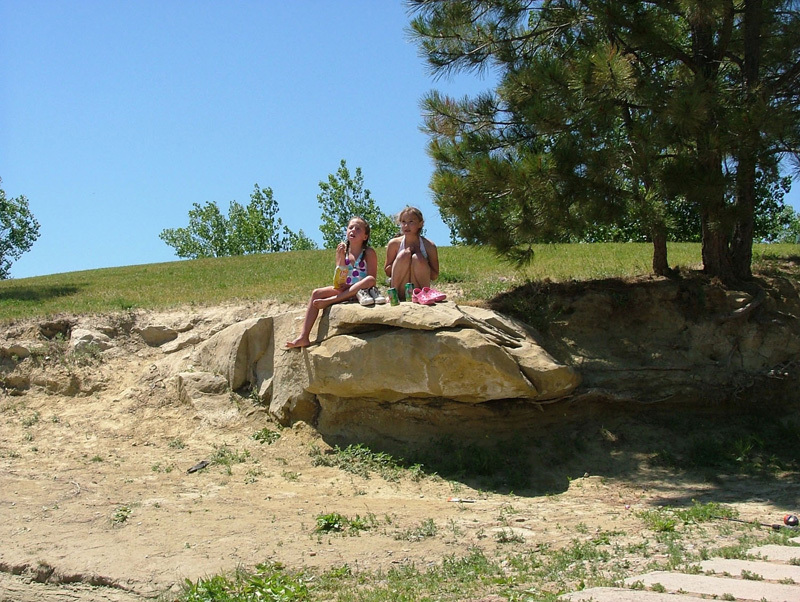 The weather cooperated for us and we had a beautiful day! 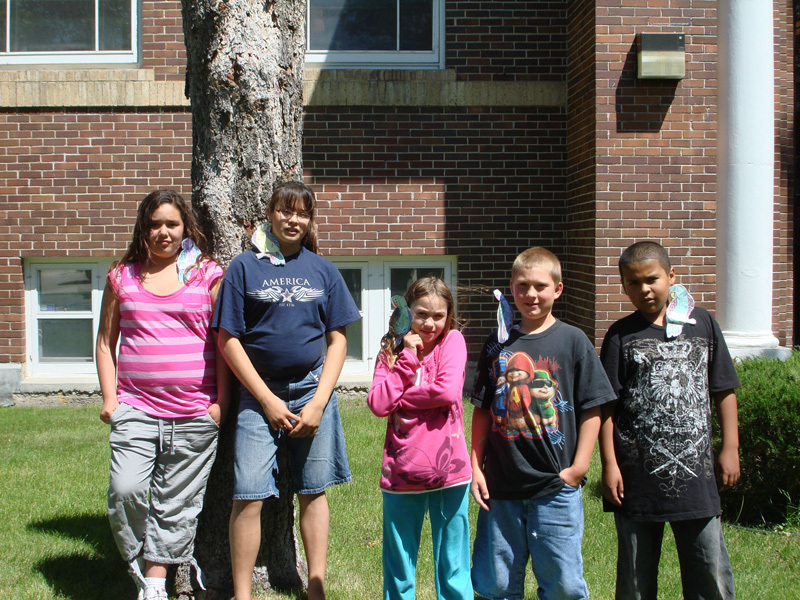 Thank you again for supporting our program this year!!! 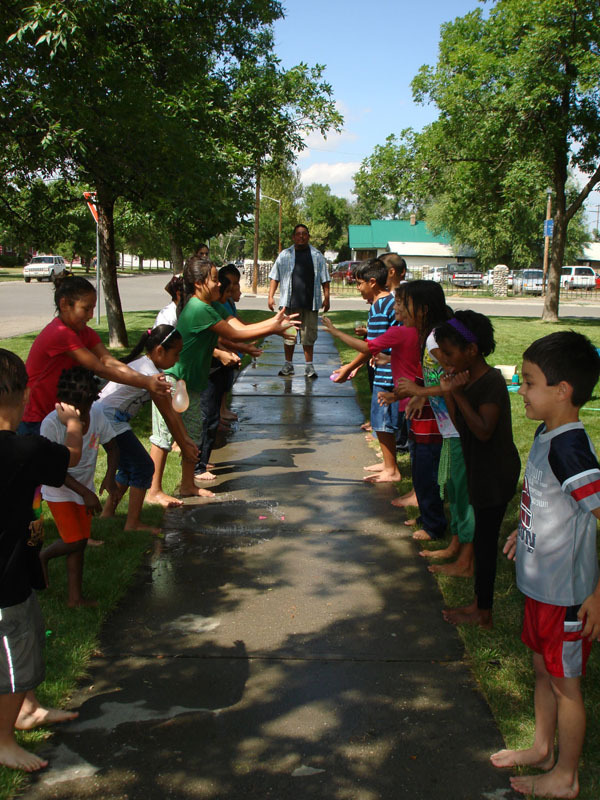 "This week was our final week of programs for the kids so we decided to have a wet and wild party for all the groups. 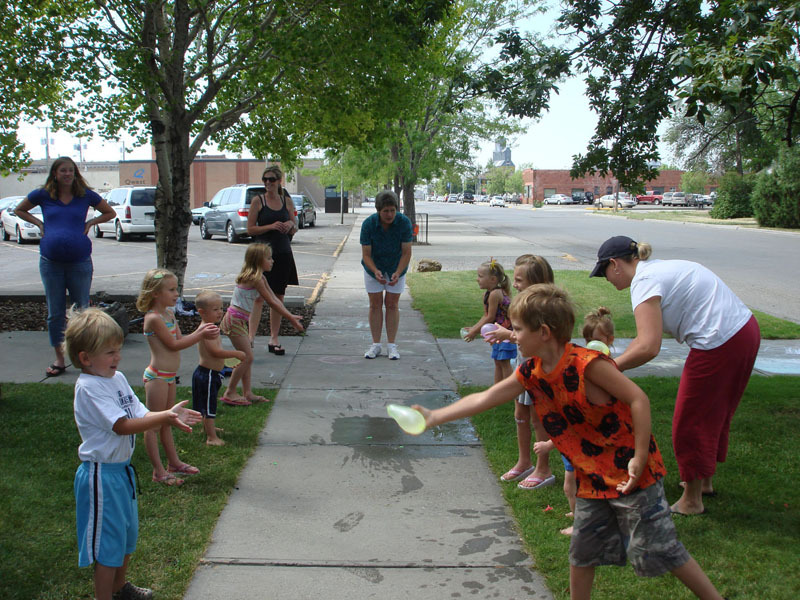 The kids started off playing games, Drip, Drip, Drench (like Duck, Duck, Goose except using a pitcher of water), Intermediate kids had a towel toss where they tossed a water balloon from one beach towel to another, the Primary and Preschool had a water balloon toss, and they all played empty the bucket, where they used a turkey-baster to get water out of a bucket and put it into another bucket or for the Preschool a large glass. 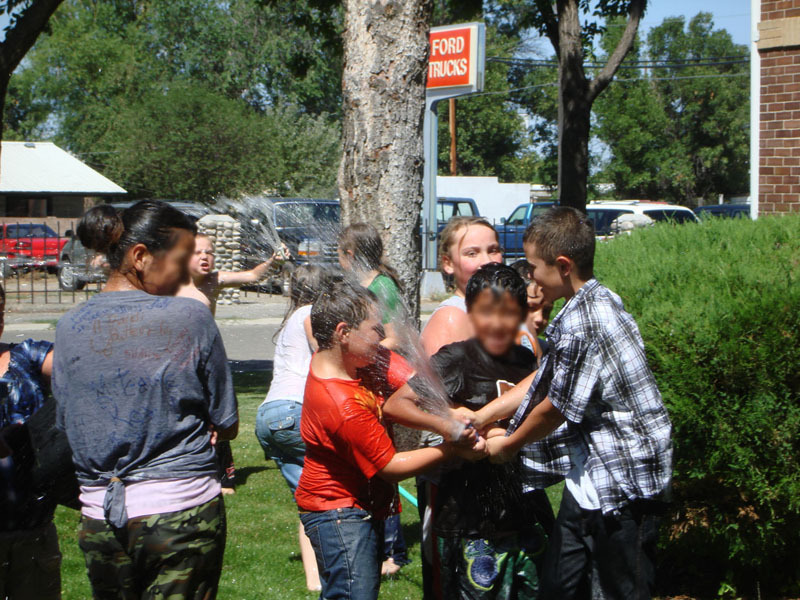 The kids had a blast and were soaking wet when they finished. 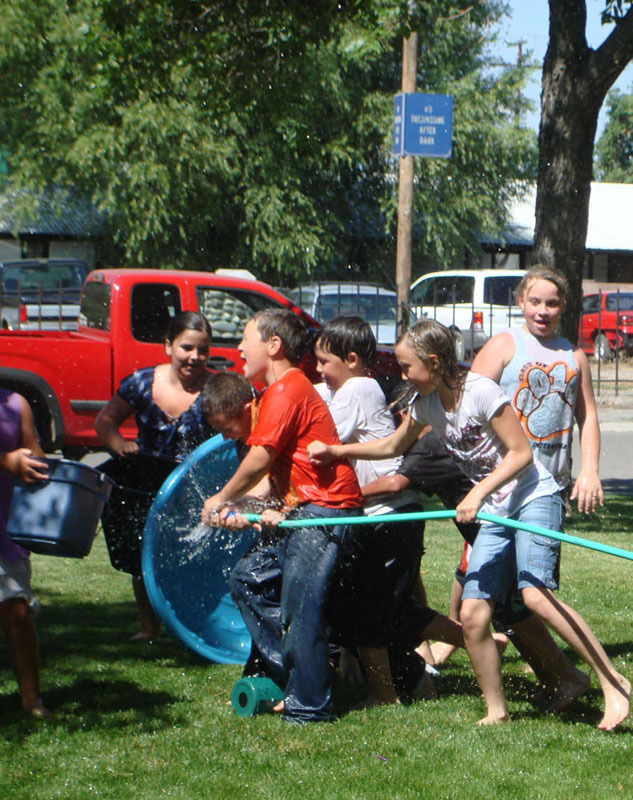 In the empty the bucket game we placed the two buckets on either side of a sprinkler so the kids were guaranteed to get good and wet. 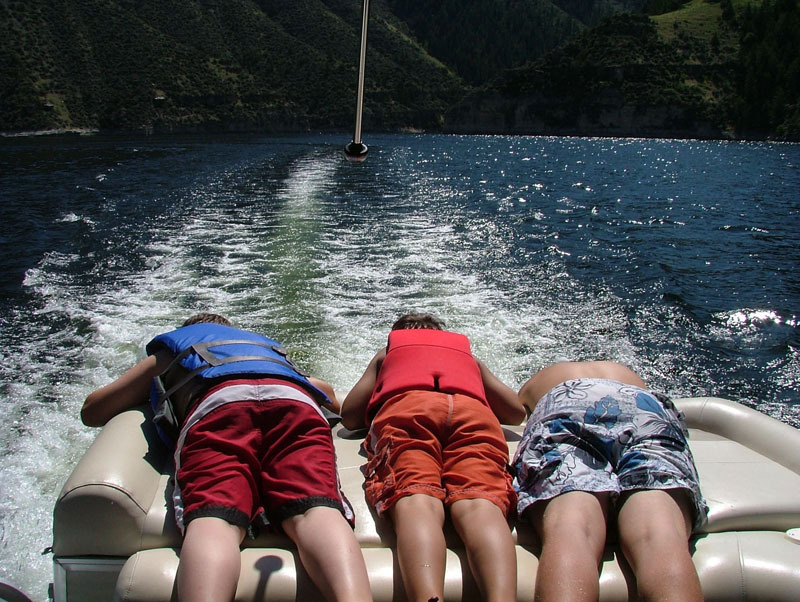 It was a great ending to a fun-filled summer." 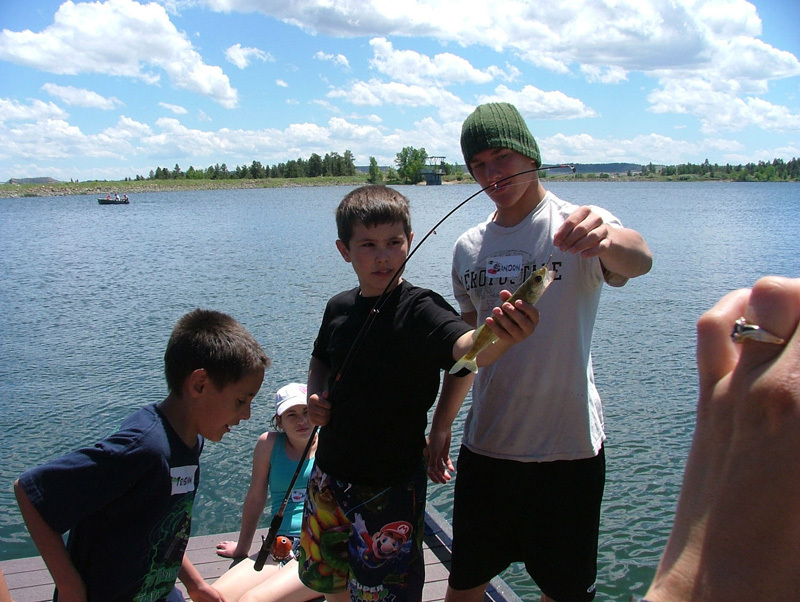 "Fish were jumping everywhere around the Primary group while we were fishing, unfortunately they weren’t biting our worms. 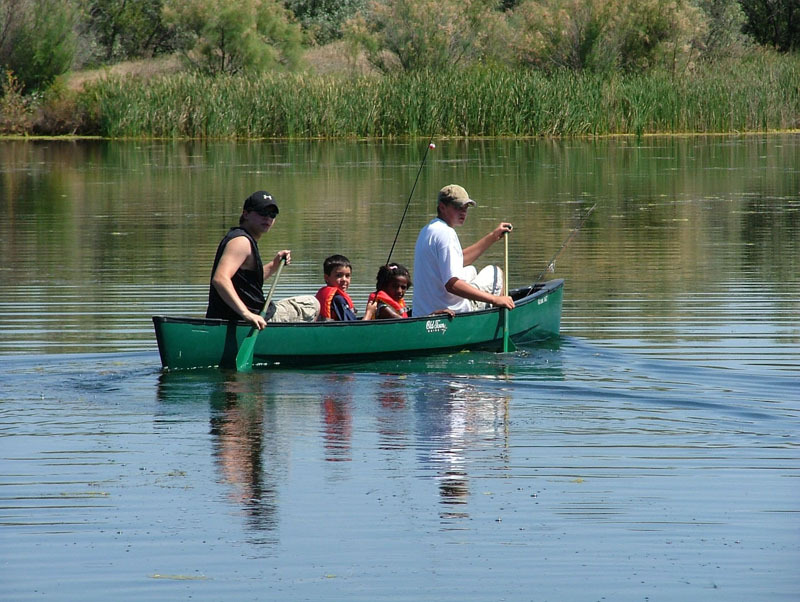 My boys, Christopher and Erik, were once again in charge of the canoe. 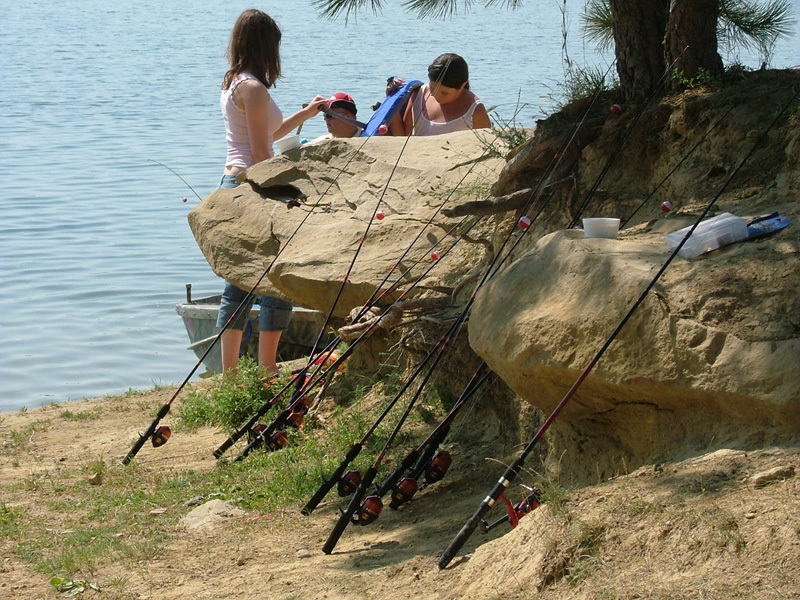 They brought their personal rods with spinners, which worked much better in catching fish. 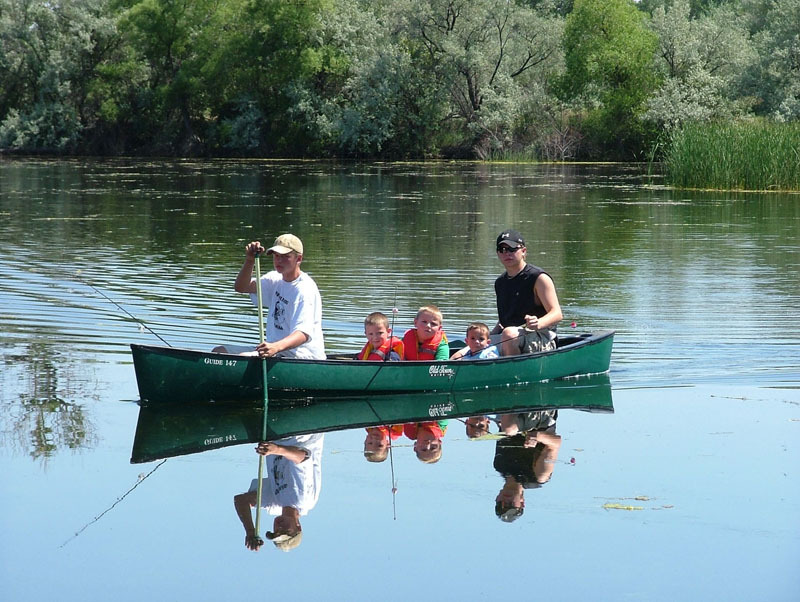 So all the kids did catch fish we just didn’t get pictures of them because they were on another part of the pond in the canoe." 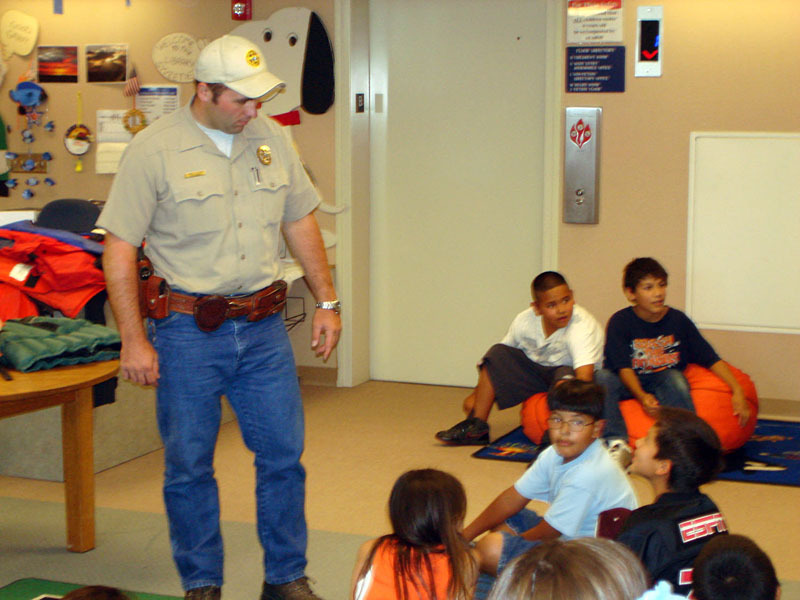 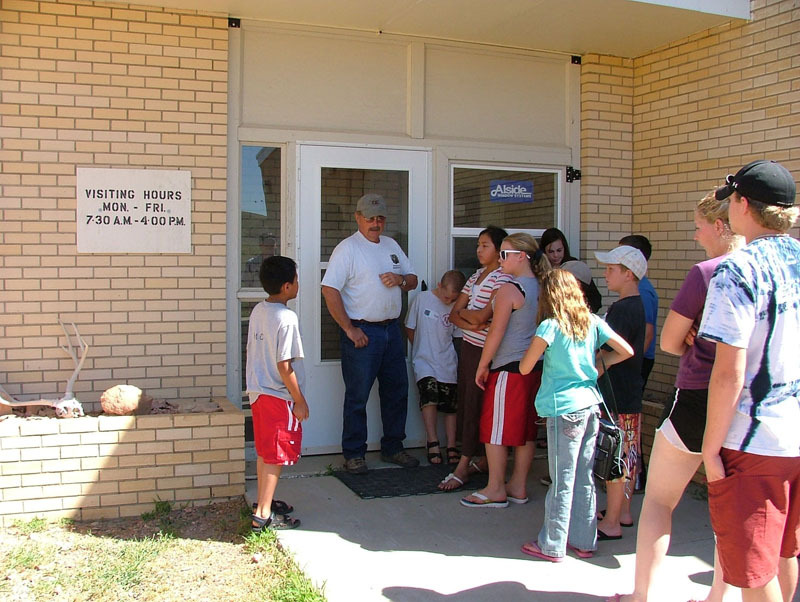 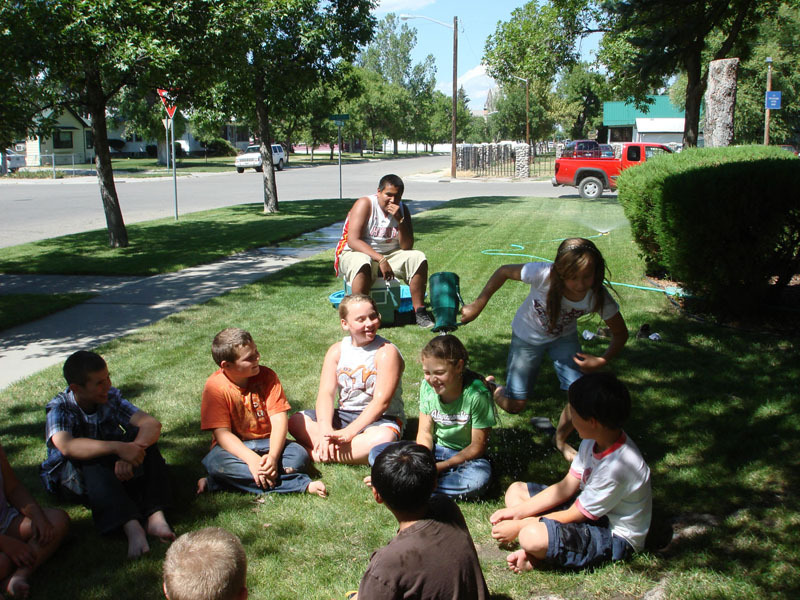 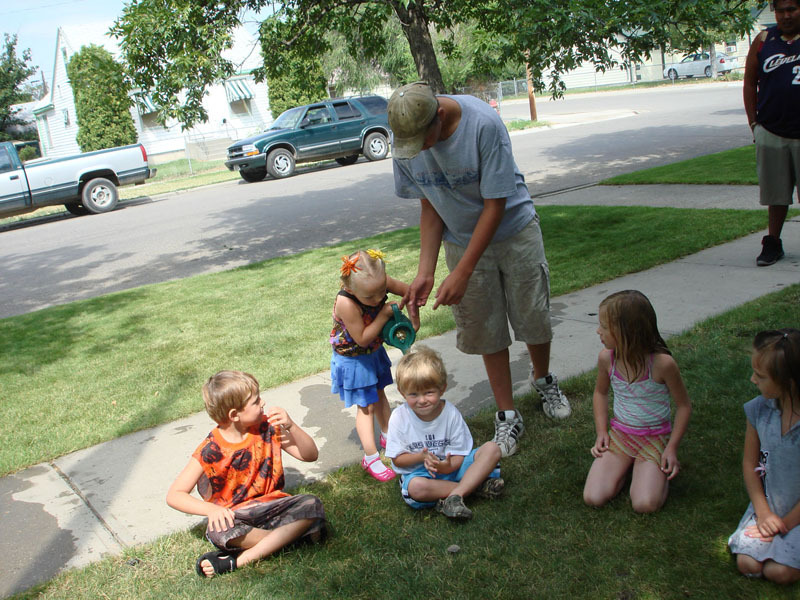 "On July 26th the Intermediate group had a guest speaker, Nick Taylor, Montana Game Warden. 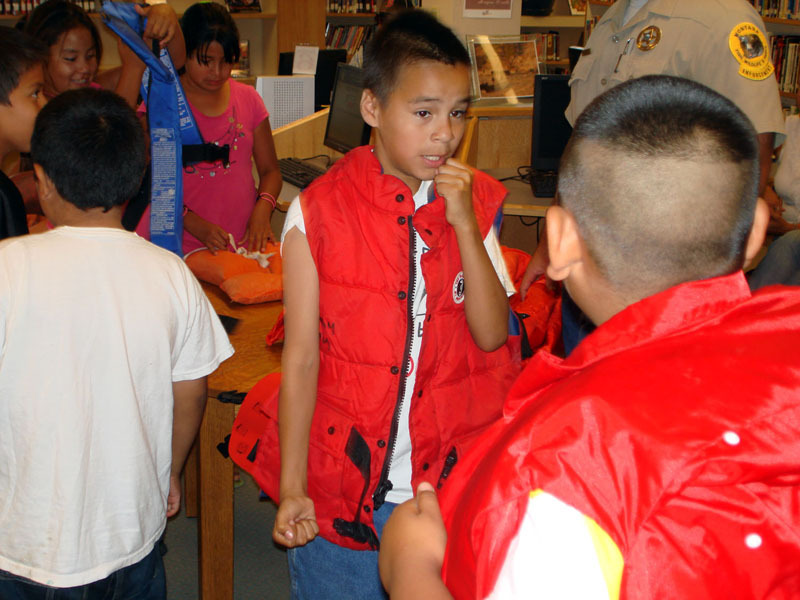 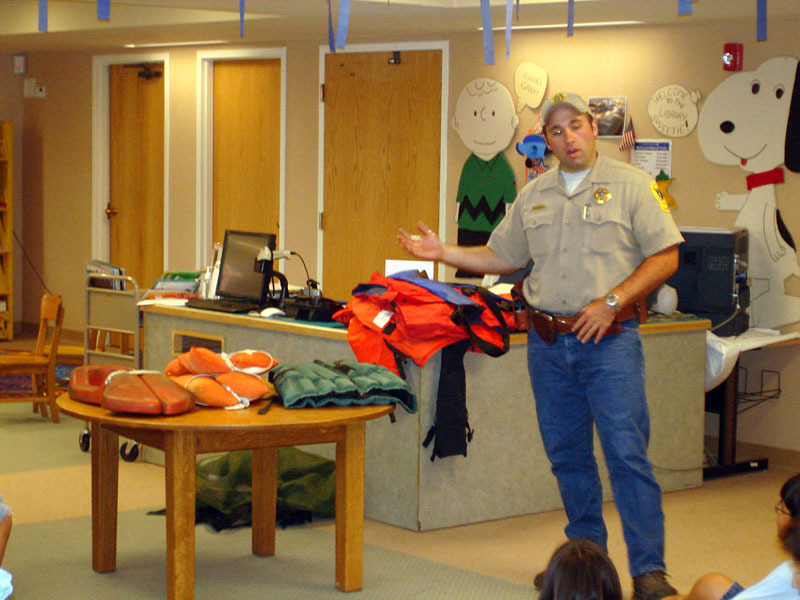 He talked with the kids about water safety and showed them different life vests. 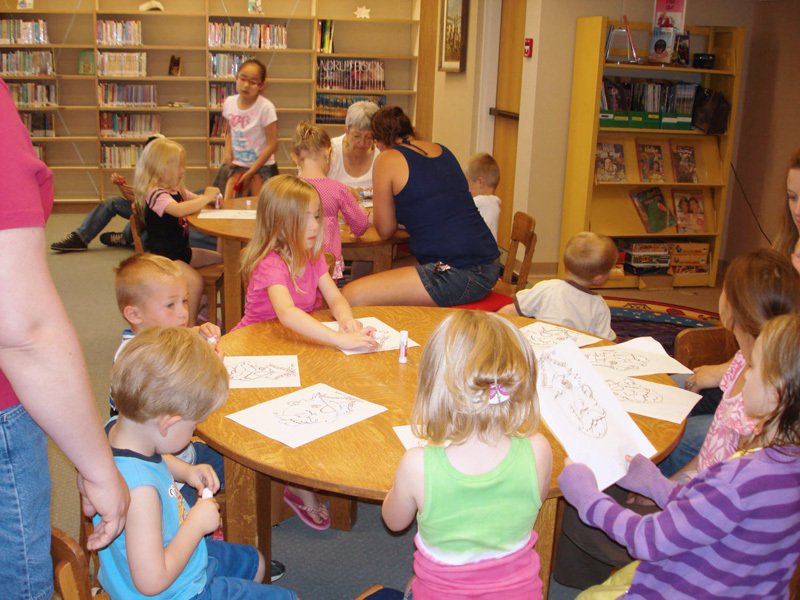 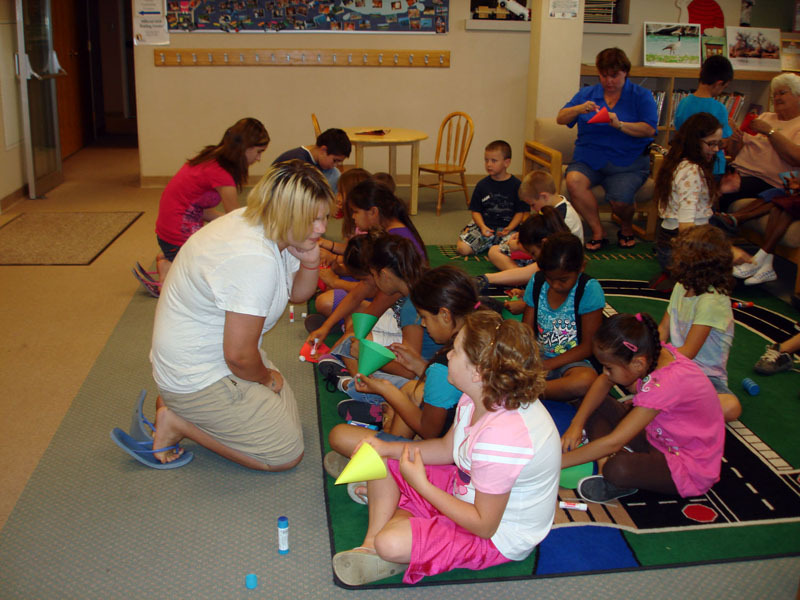 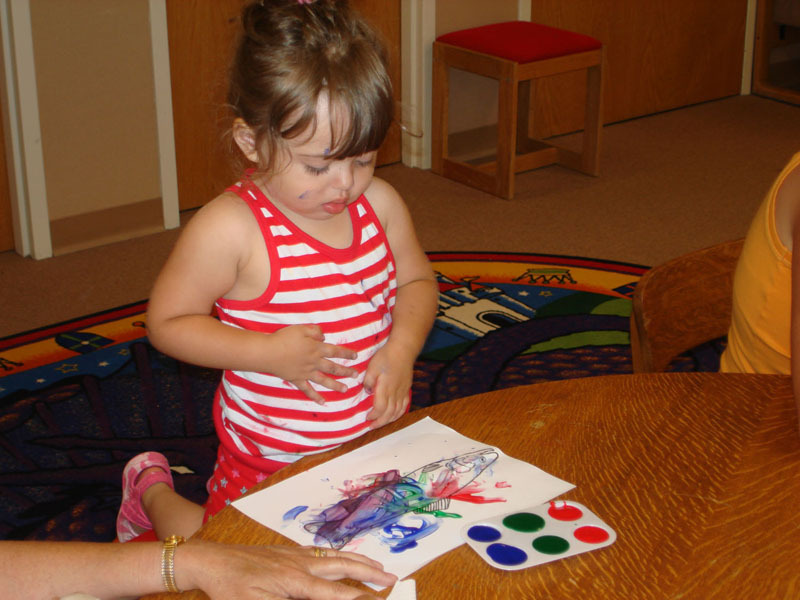 July 27 & 28 the Primary and Preschool groups made umbrella games. 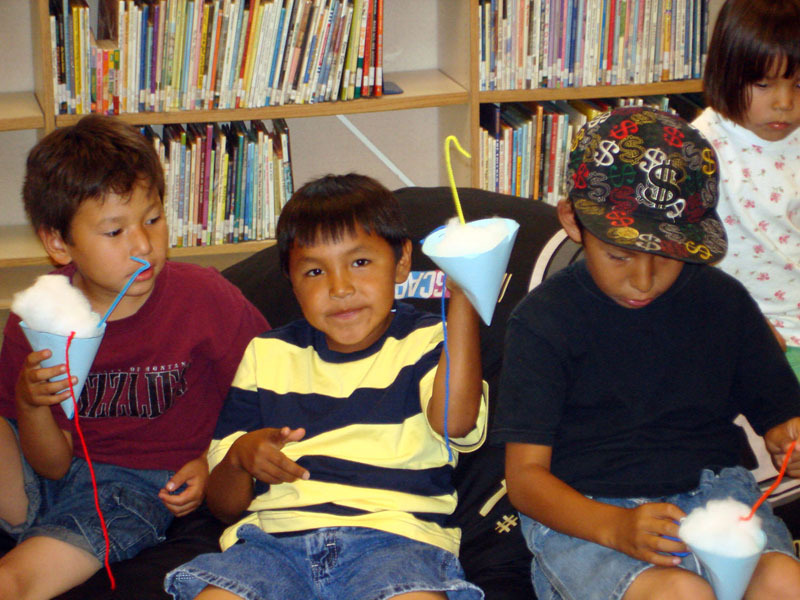 They created a cone then used a pipe cleaner to make the umbrella handle. 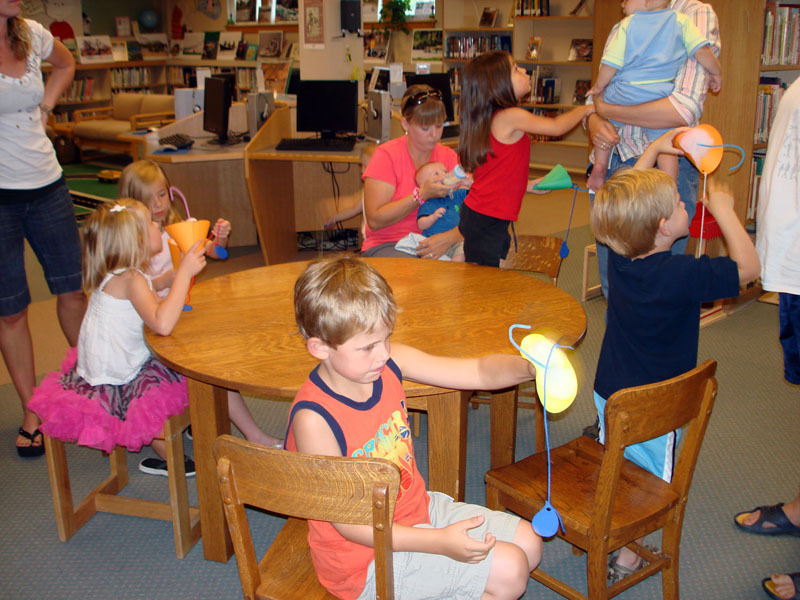 Then they put some stuffing inside the umbrella to help hold the handle in place. 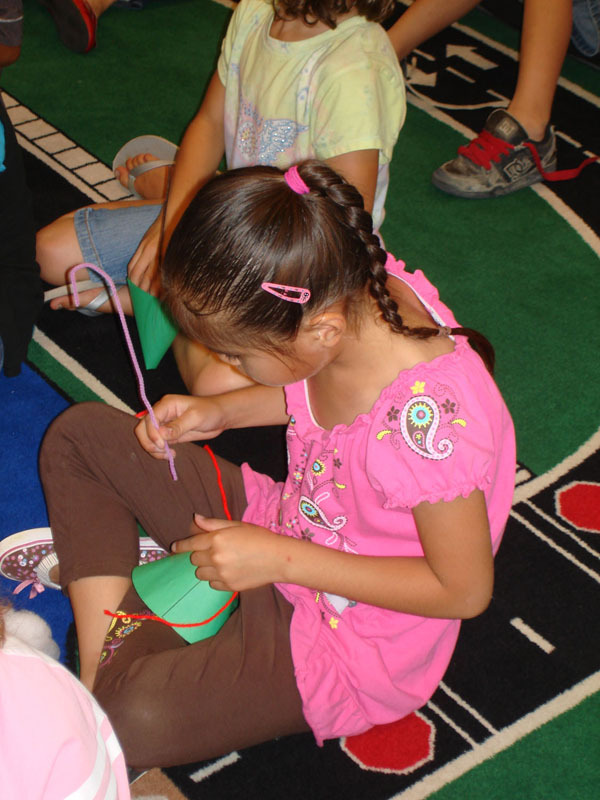 Kids tied on a piece of yarn to their umbrella and tied a raindrop on the other end. 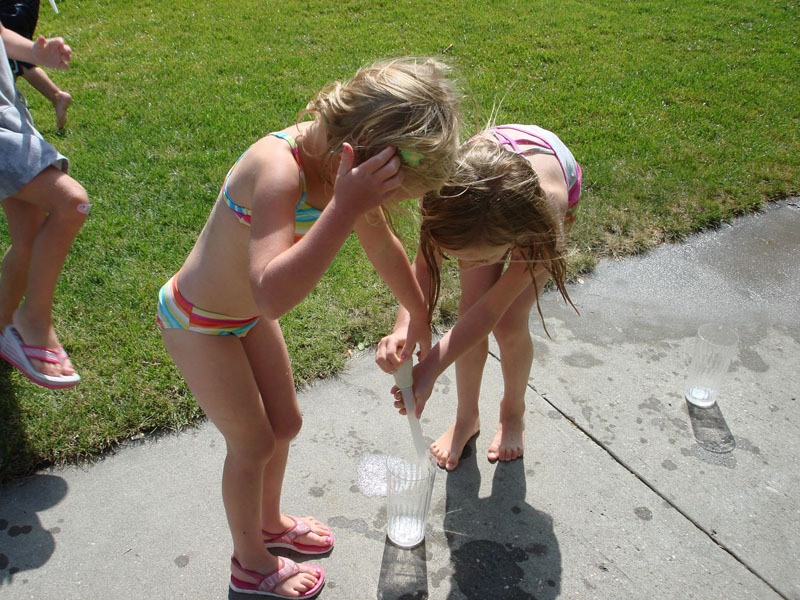 The game was to hold the umbrella and swing the raindrop and try and get it to land in the umbrella." 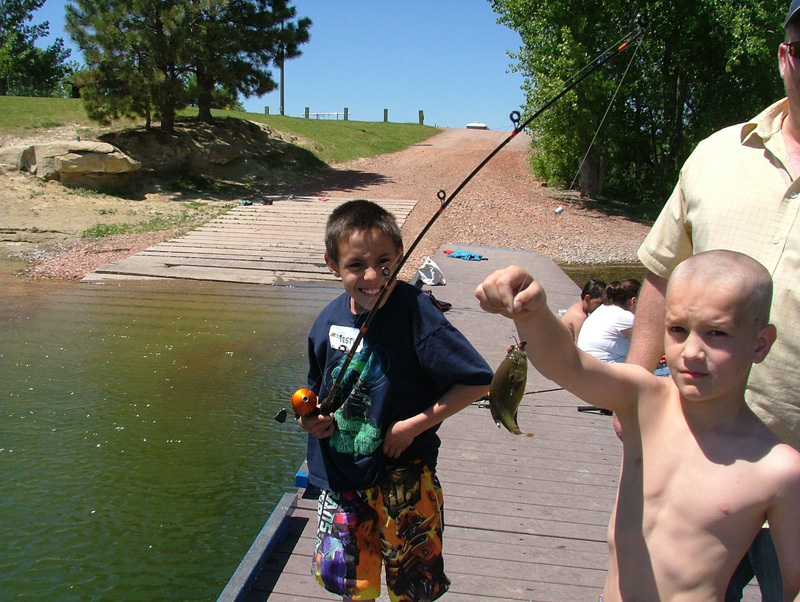 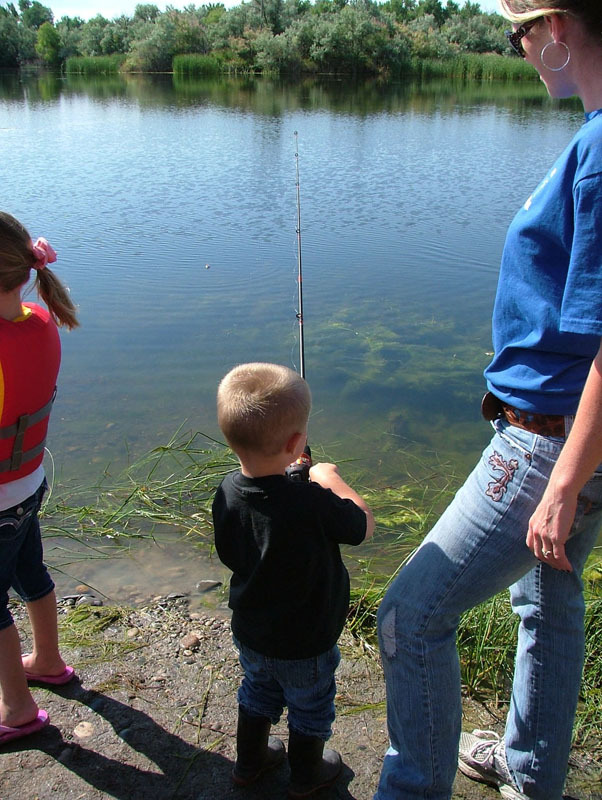 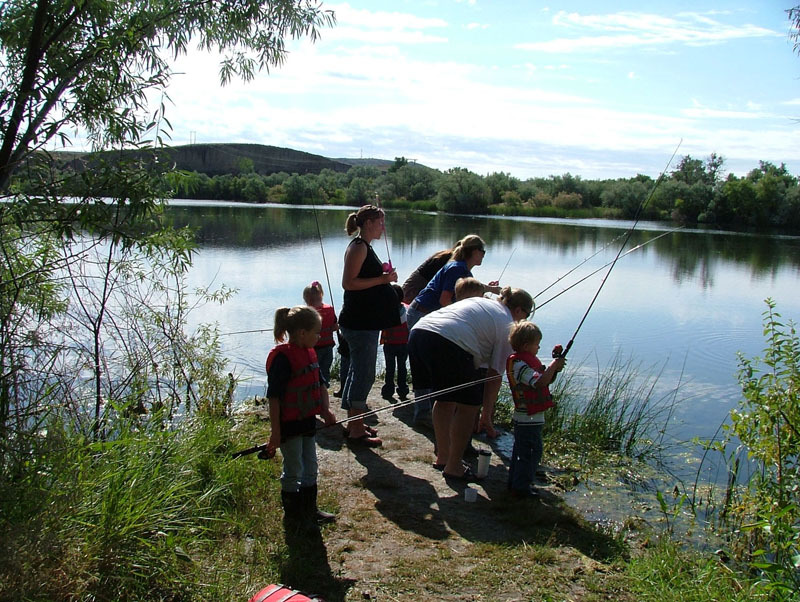 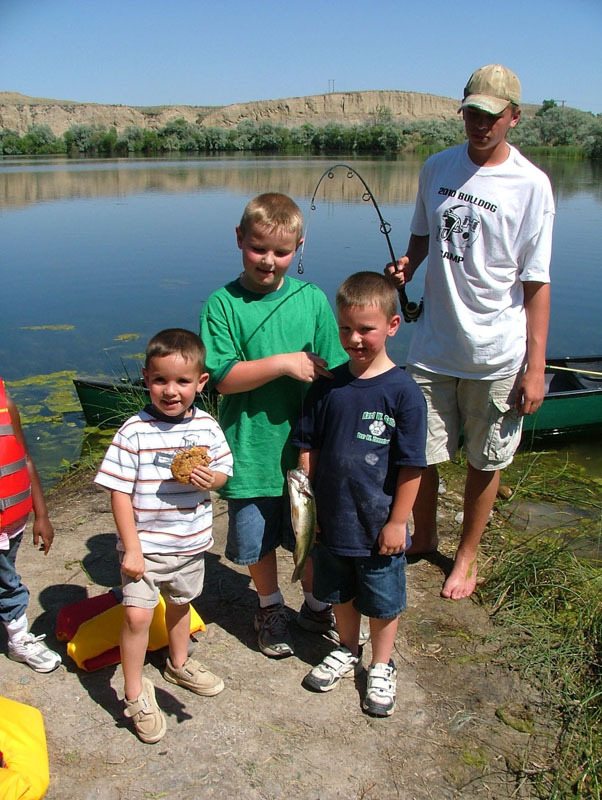 "The preschoolers seemed to have a lot of fun fishing. 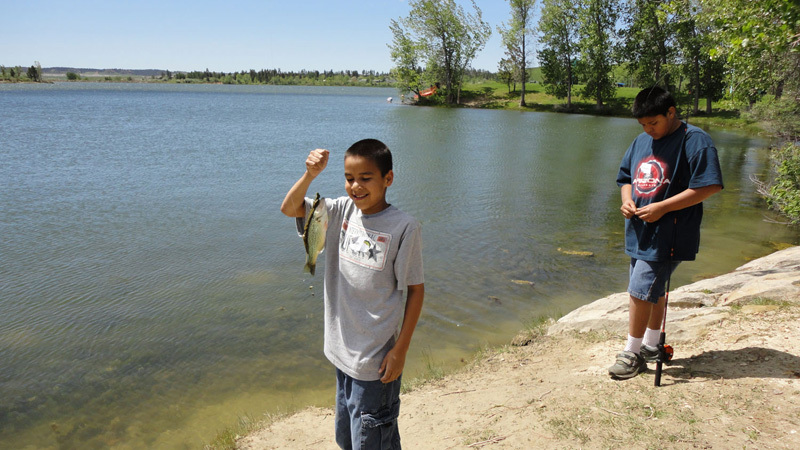 Every child that went fishing reeled in a fish! 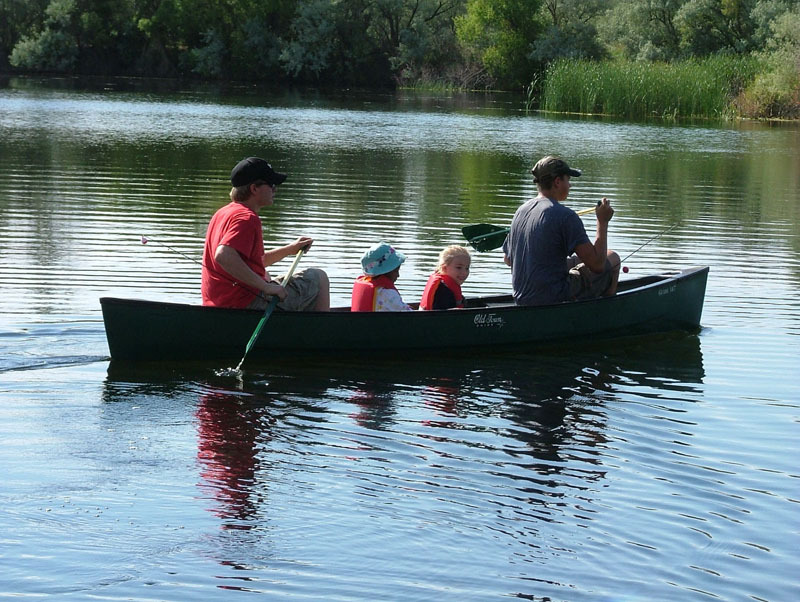 They also enjoyed being out on the canoe. 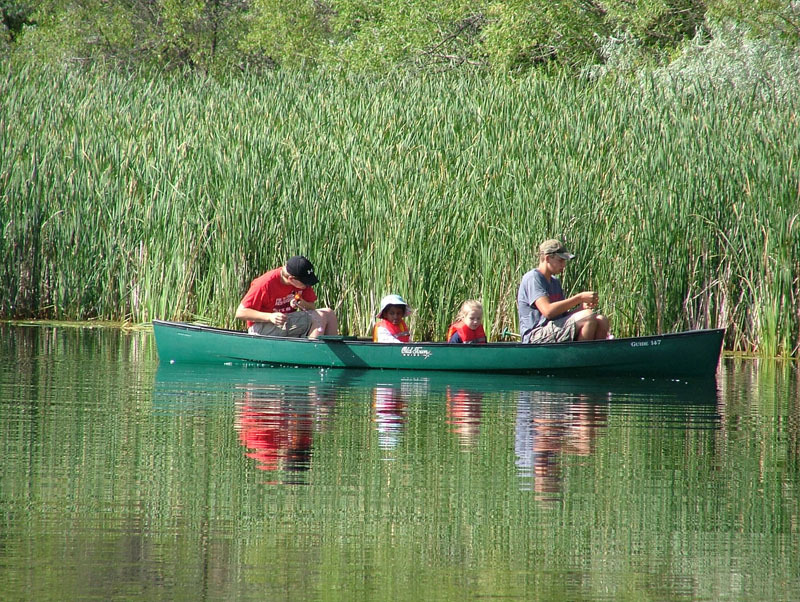 I put my two boys to work paddling the canoe." 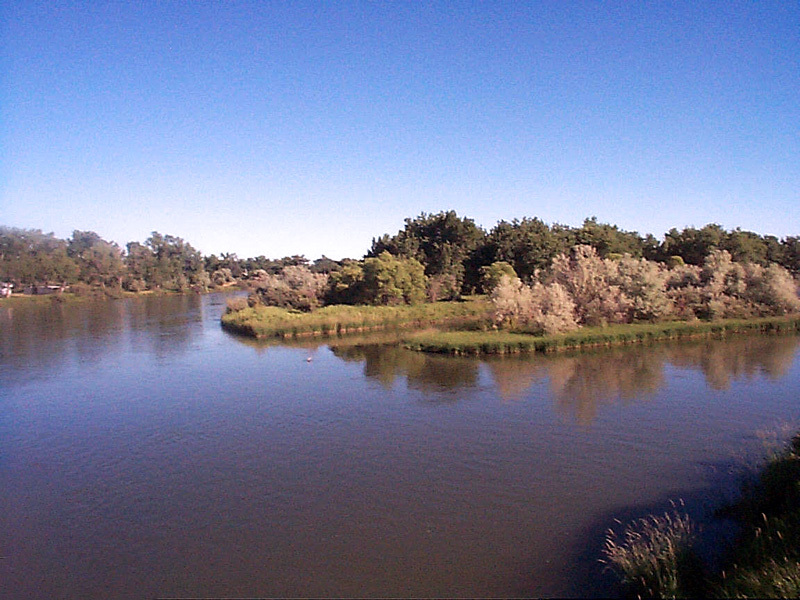 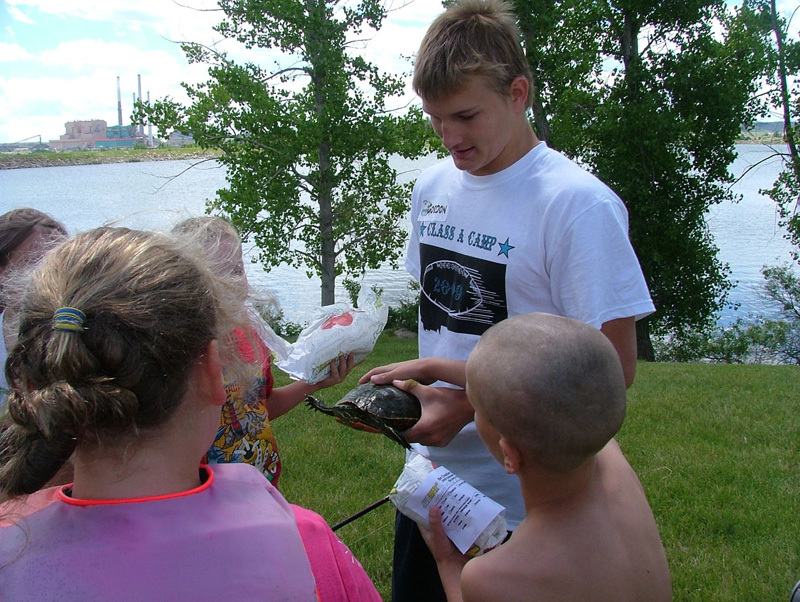 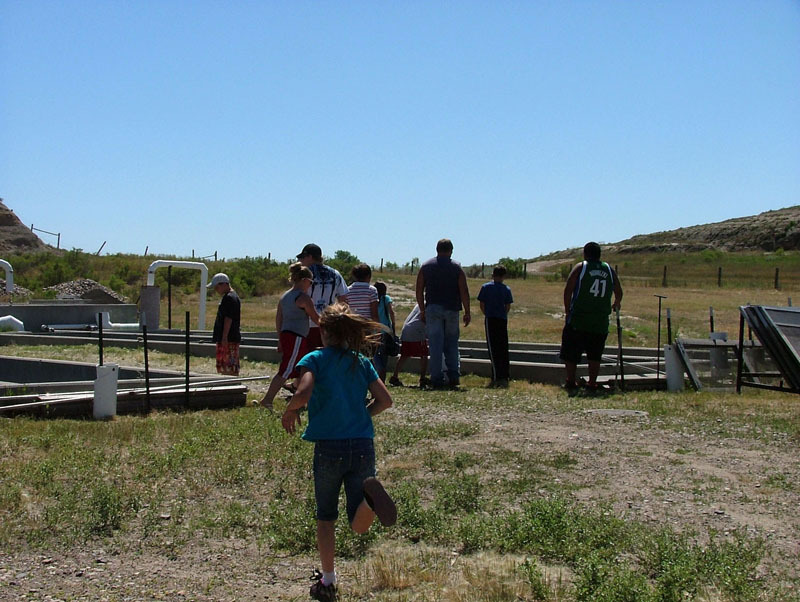 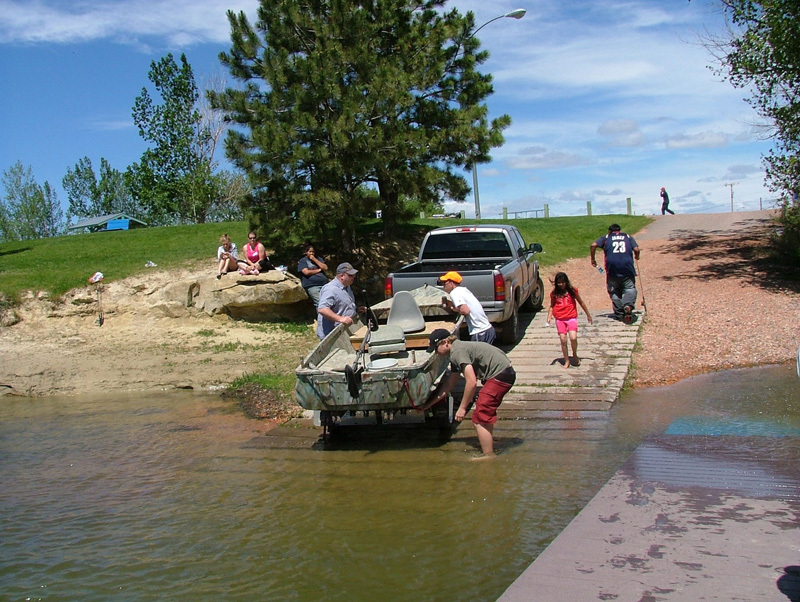 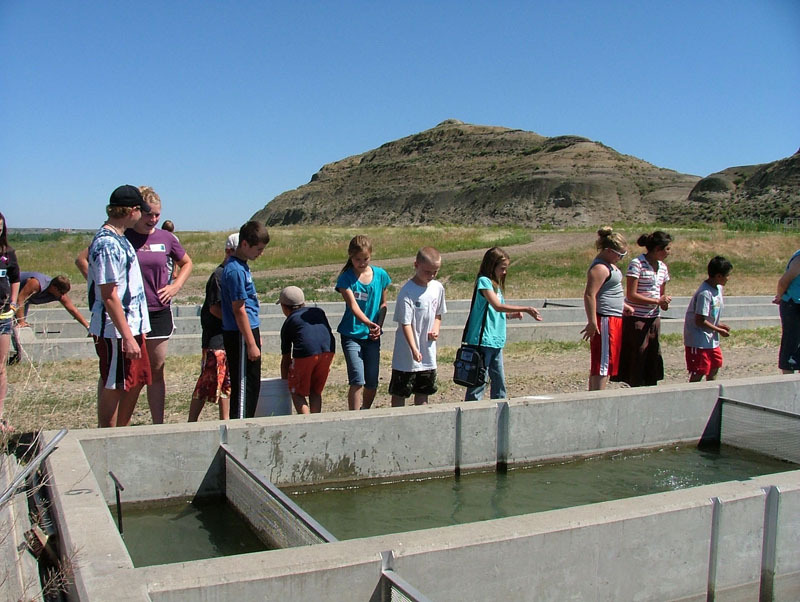 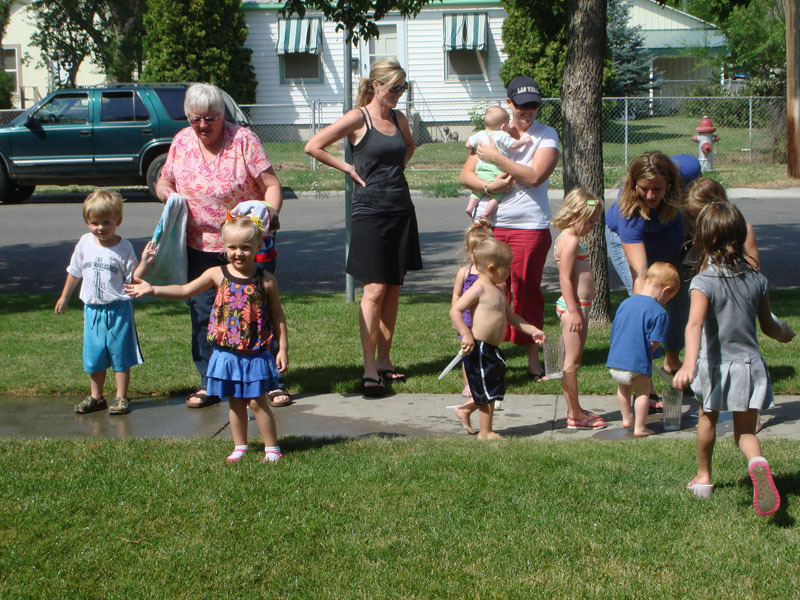 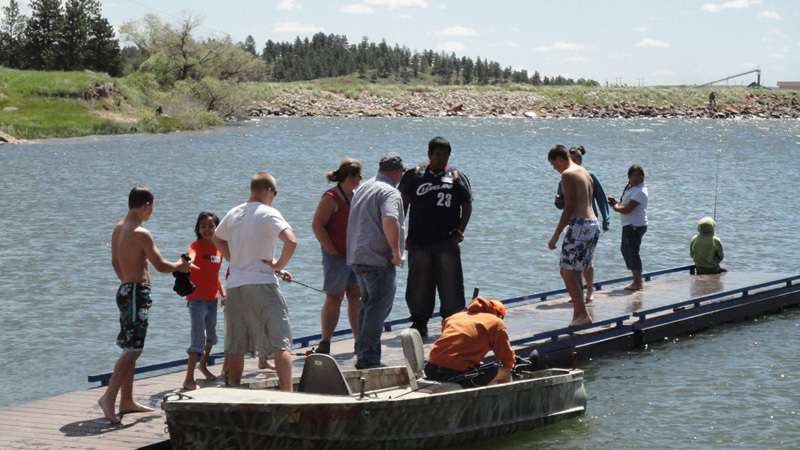 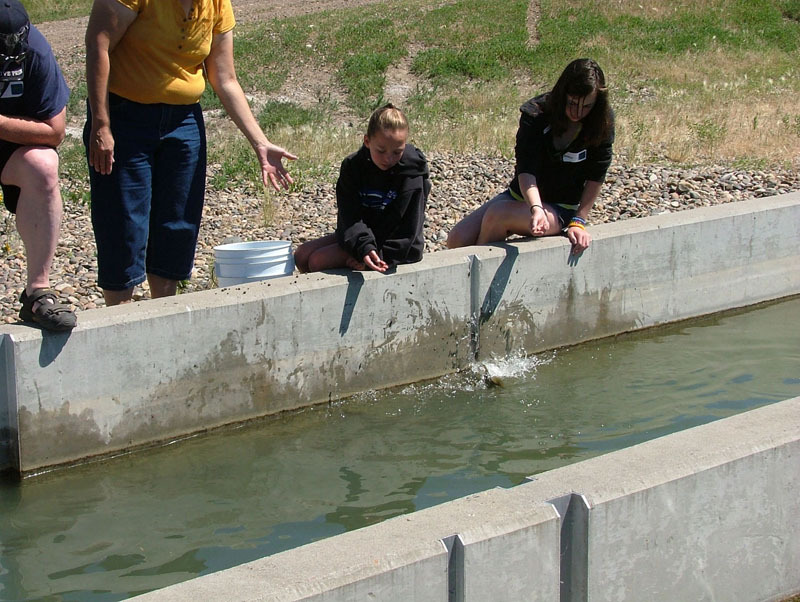 "Participants enjoyed the Miles City Fish Hatchery. 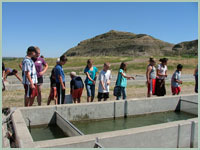 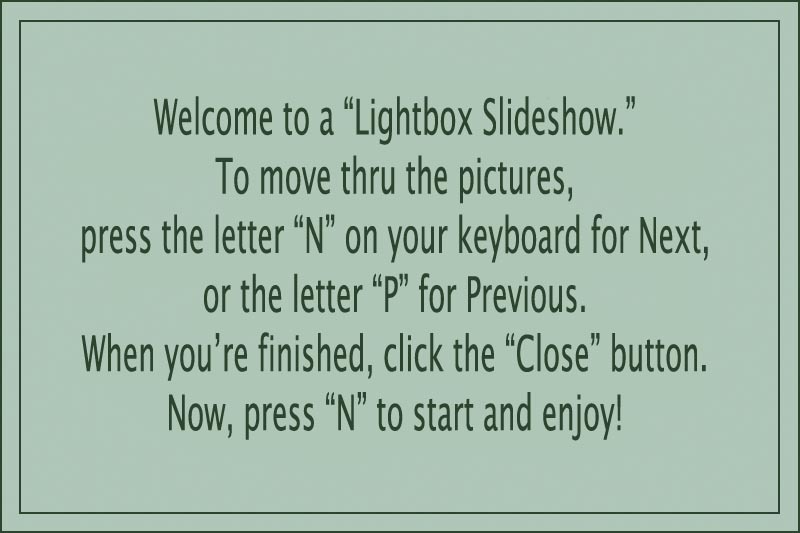 They were shown a video about what happens at the hatchery. 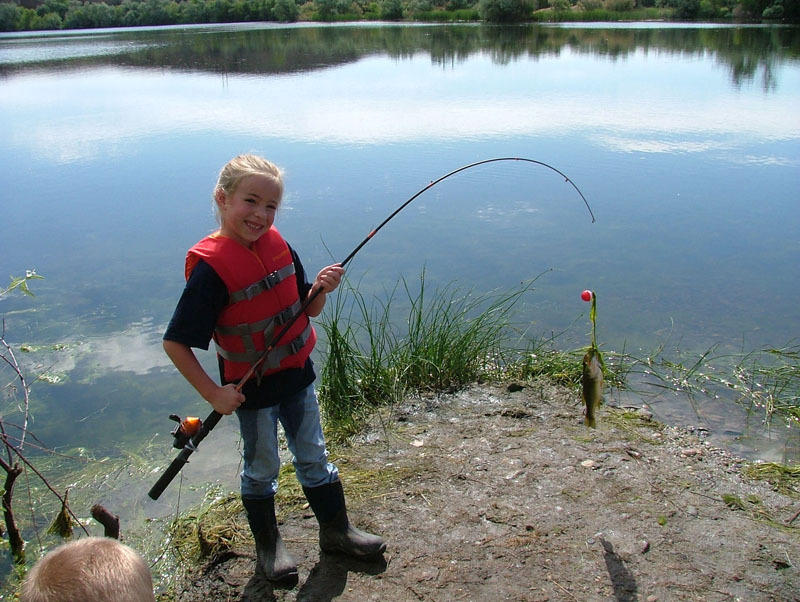 Unfortunatly they didn’t have the different stages of fish development, as they have more of the smaller fish in the spring then release them into lakes and rivers. 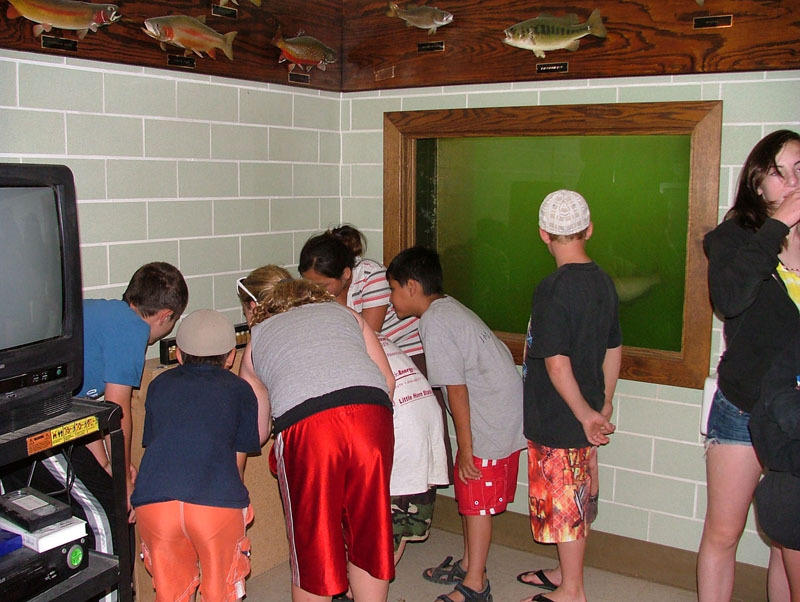 They did have Smallmouth and Largemouth Bass in the outdoor tanks. 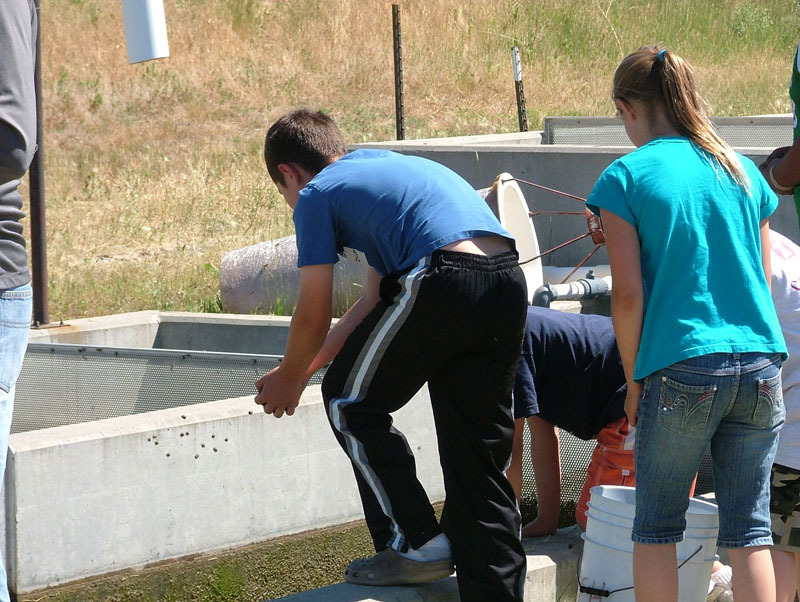 The kids were given food to feed the fish, which they really enjoyed. 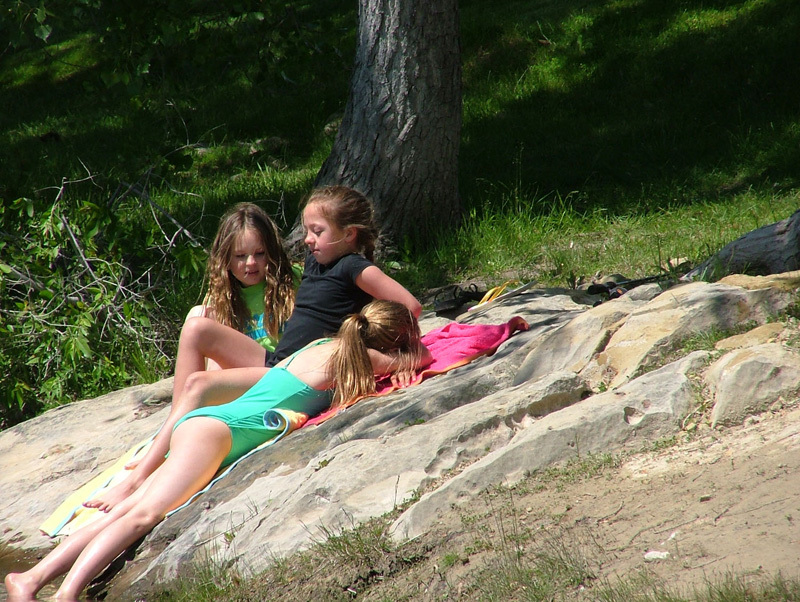 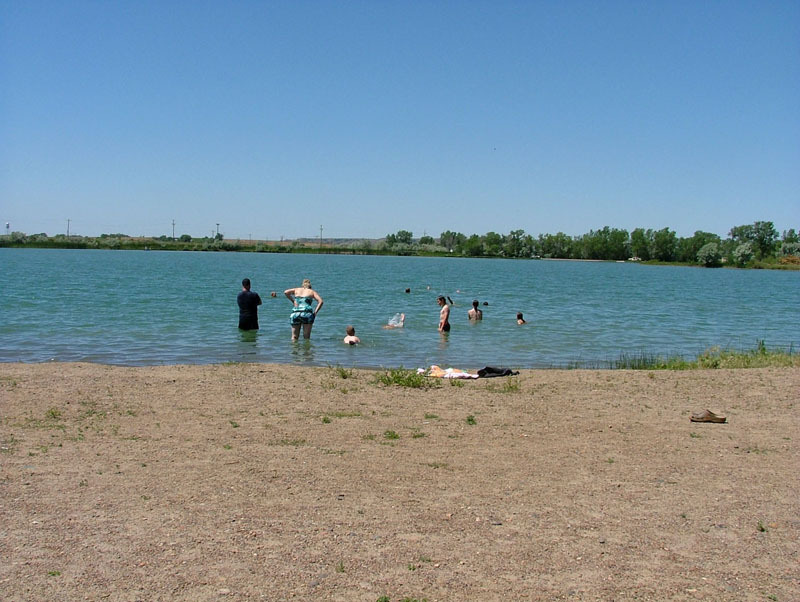 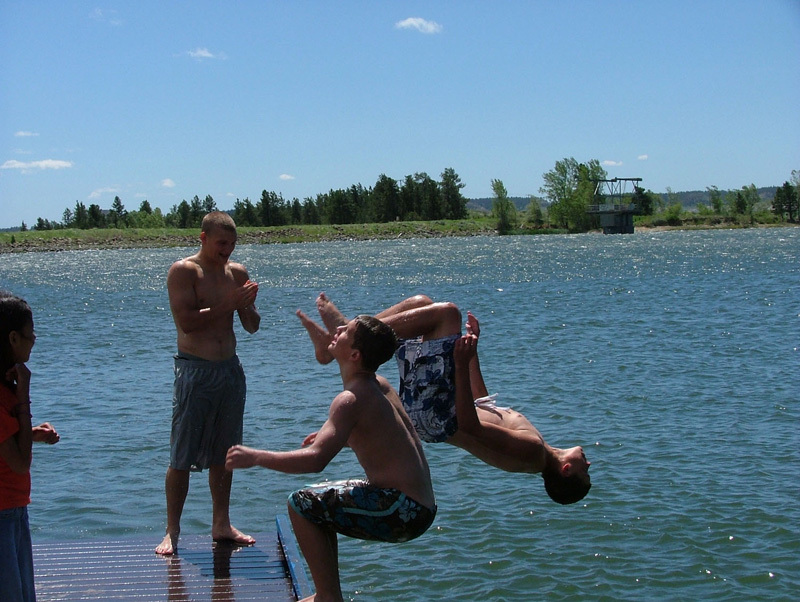 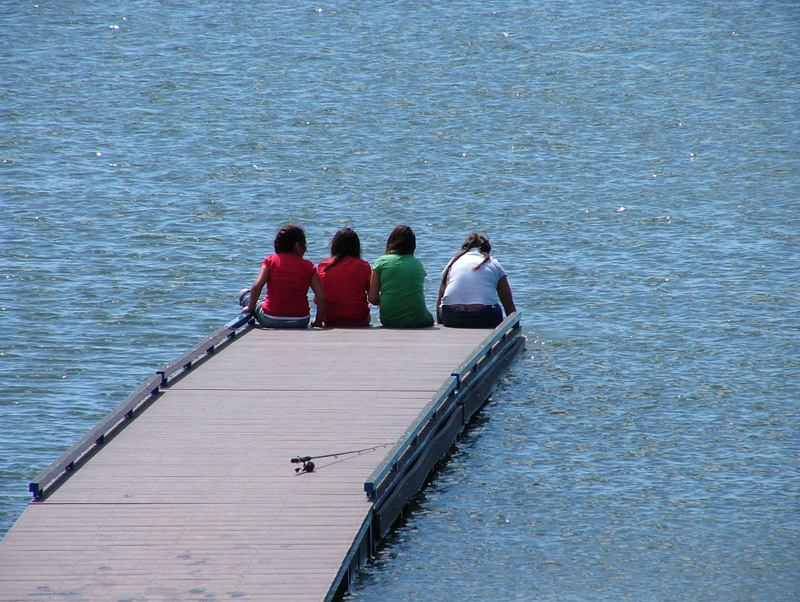 I also attached one photo of the kids swimming at Spotted Eagle Lake near Miles City." 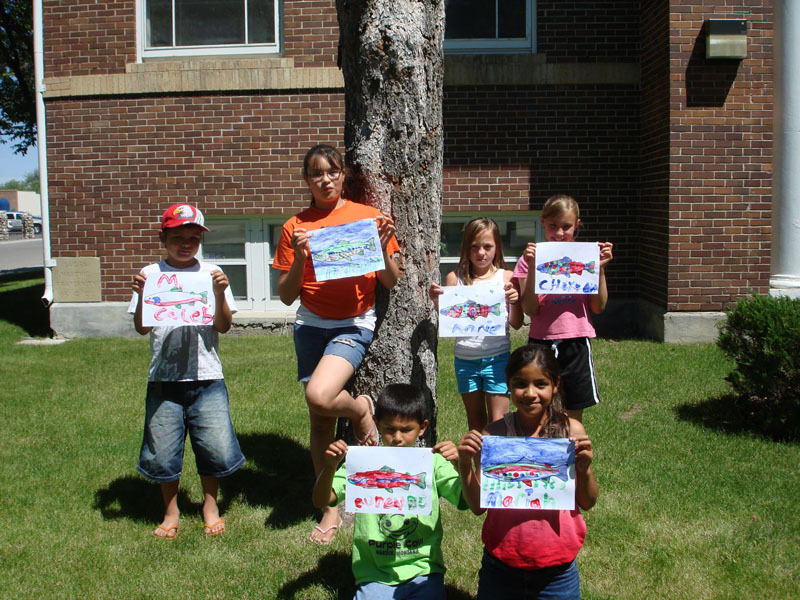 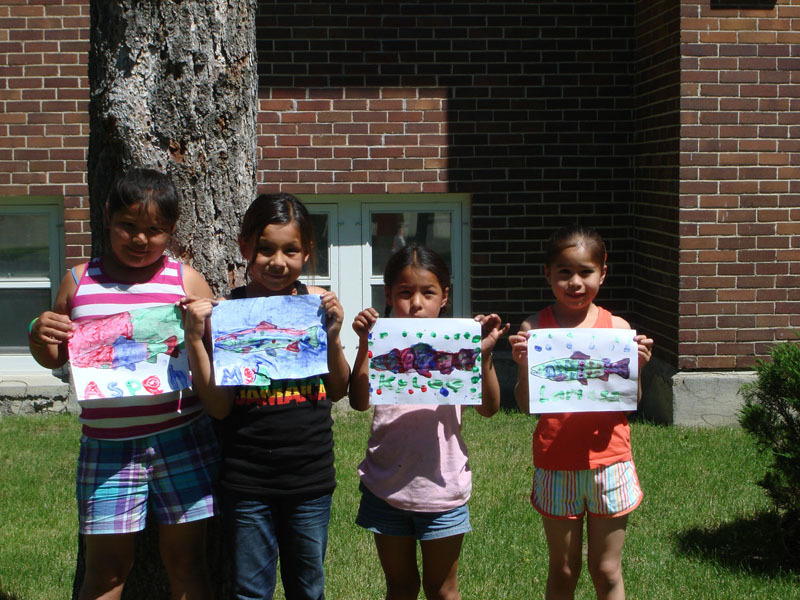 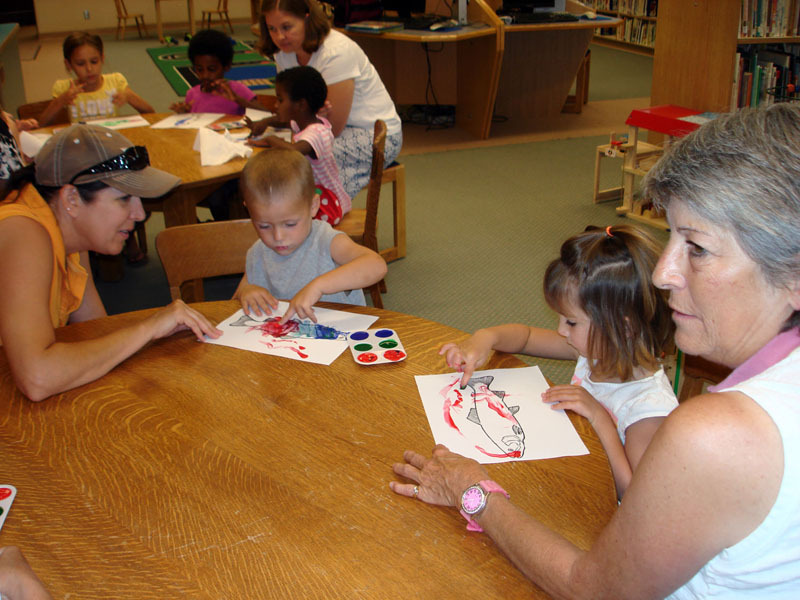 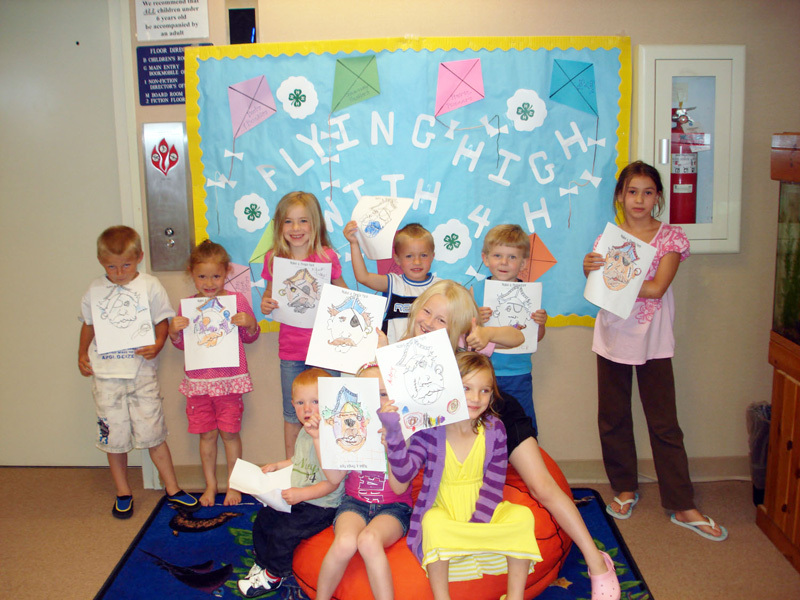 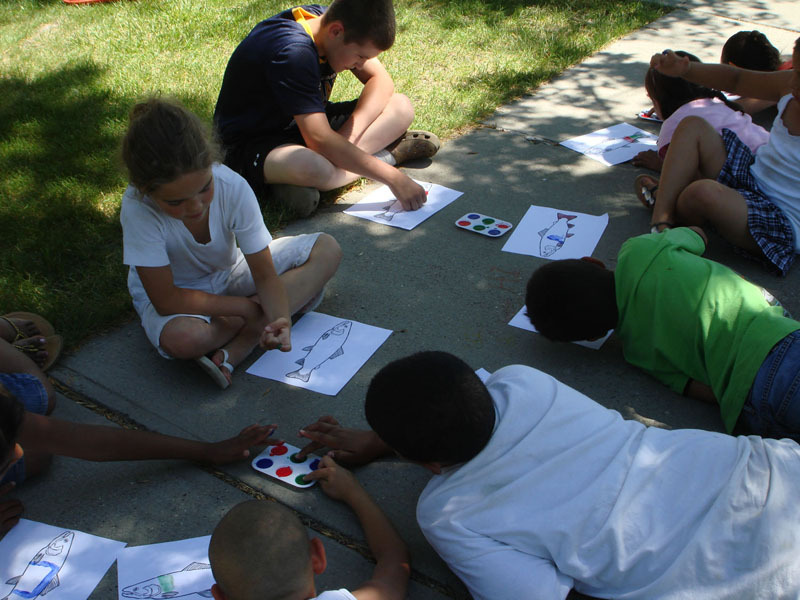 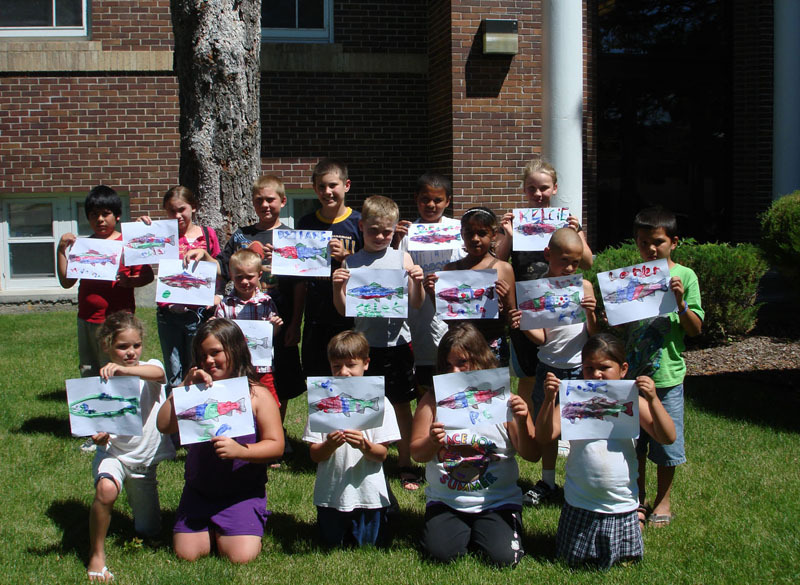 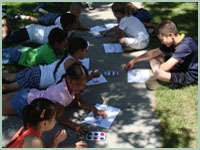 All the participants, Preschool – 6th grades, finger painted fish. 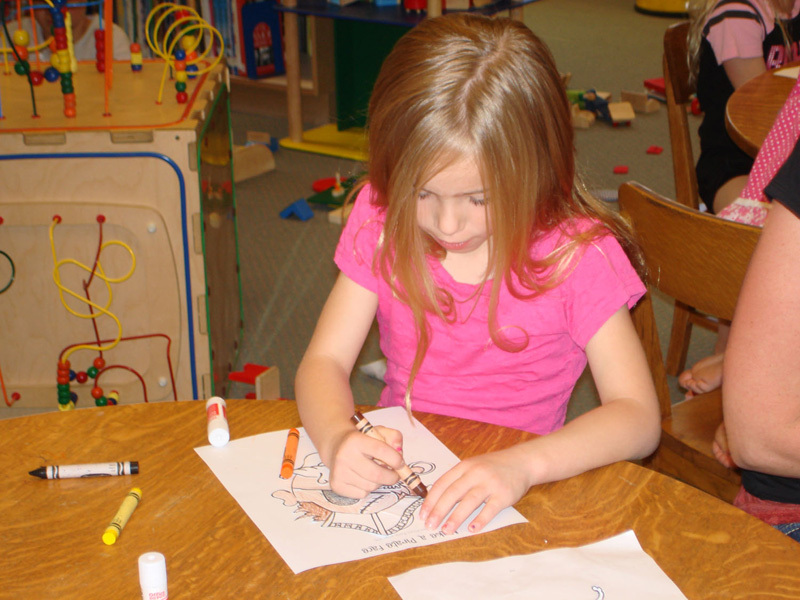 "June 21 – 23 we read stories about pirates. 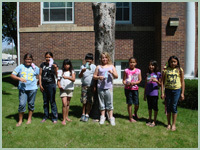 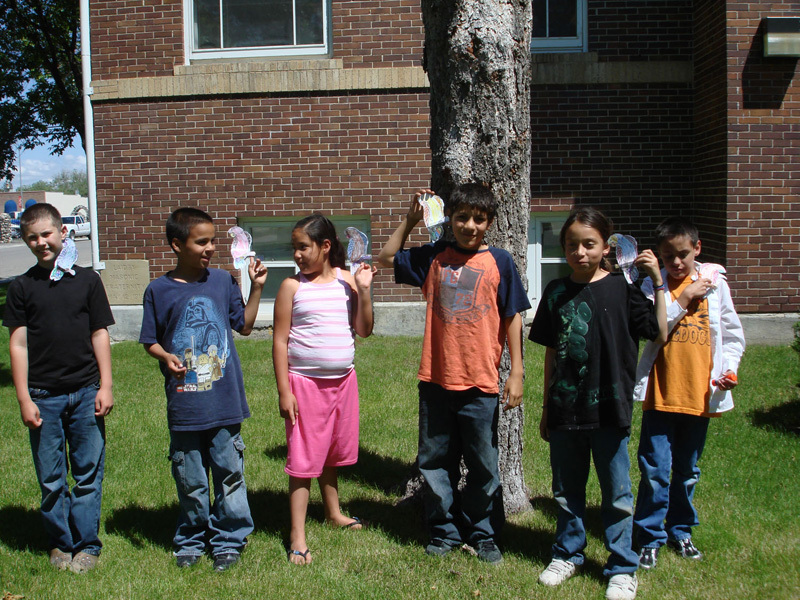 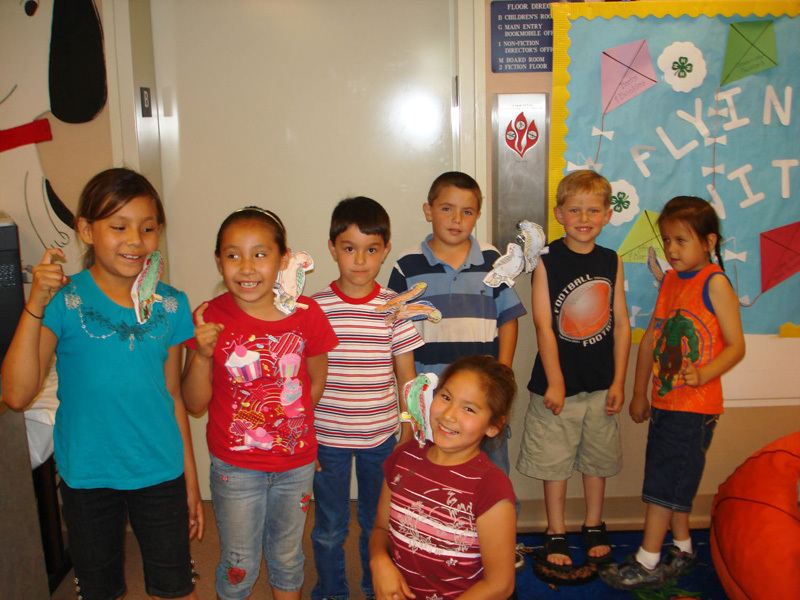 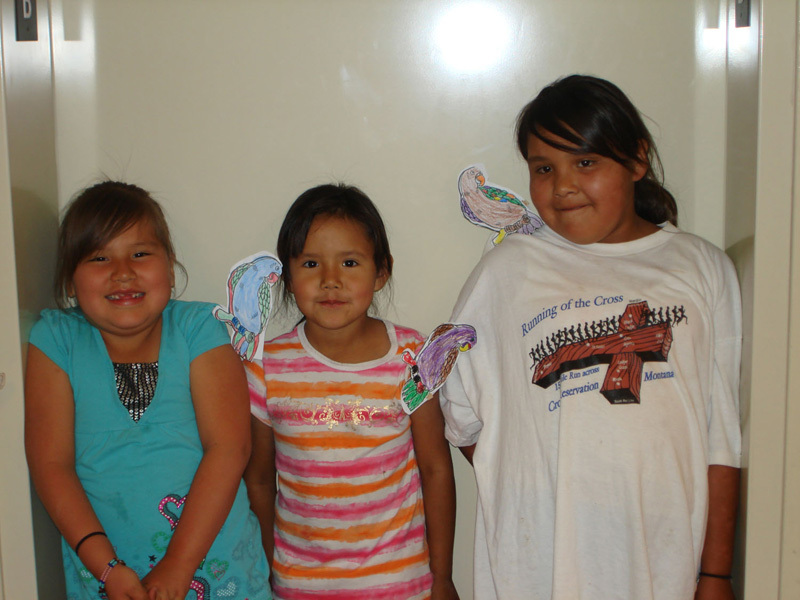 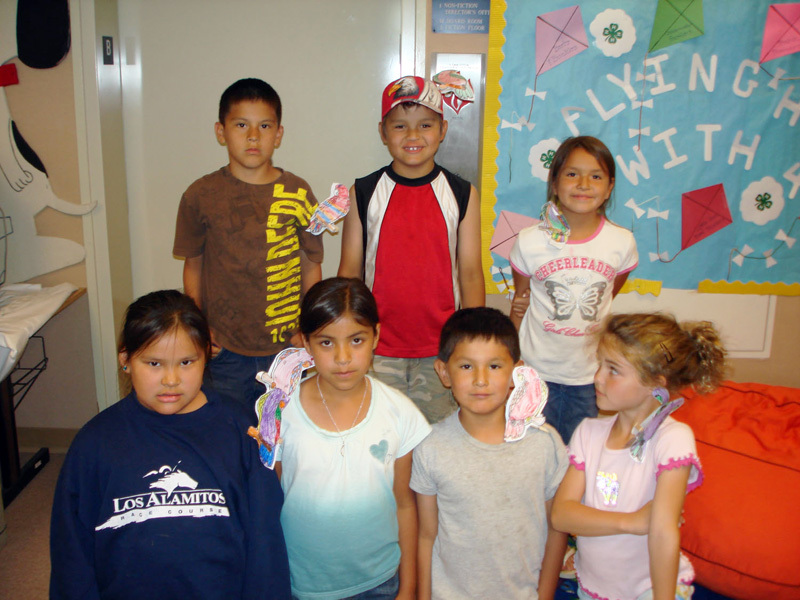 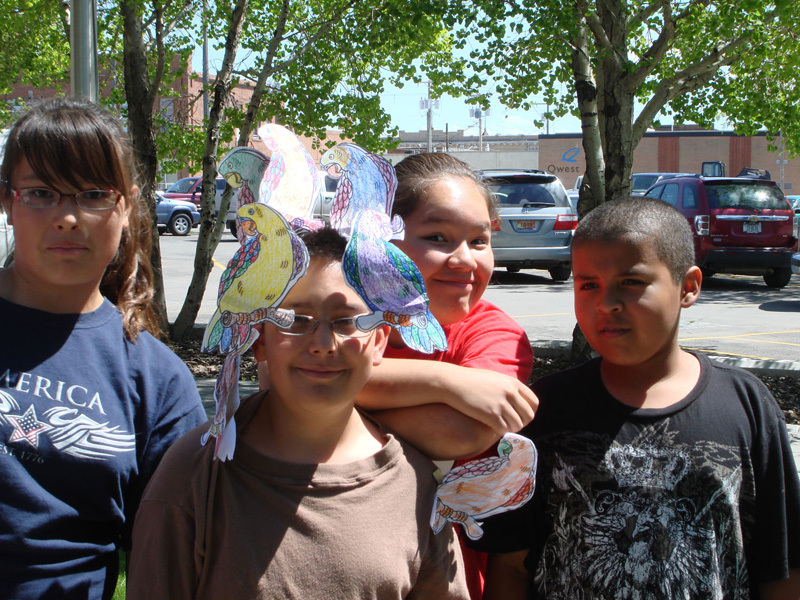 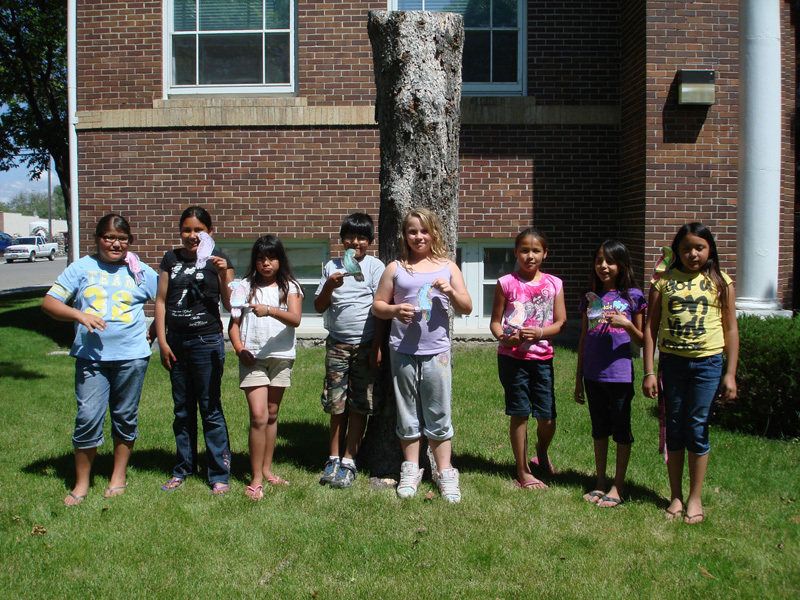 The Intermediate and Primary groups (K-6 grades) made parrots to clip onto their shoulders. 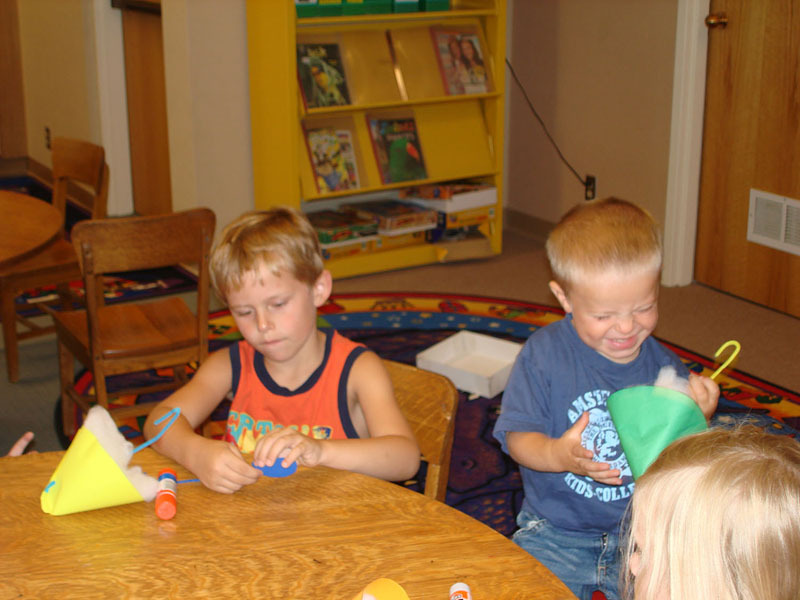 Preschoolers created their own Pirate face. 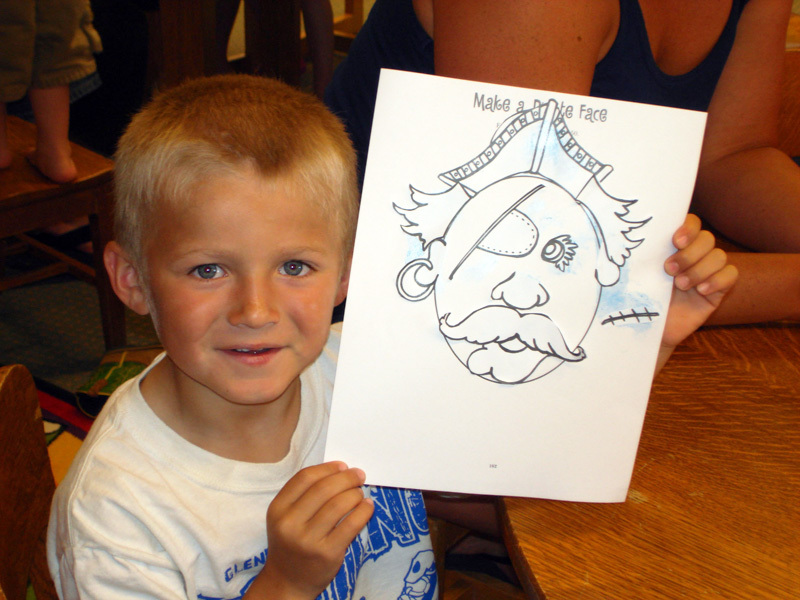 We had 34 3rd - 6th graders and 29 K - 2nd graders that made parrots and 12 Preschoolers that made a pirate face. 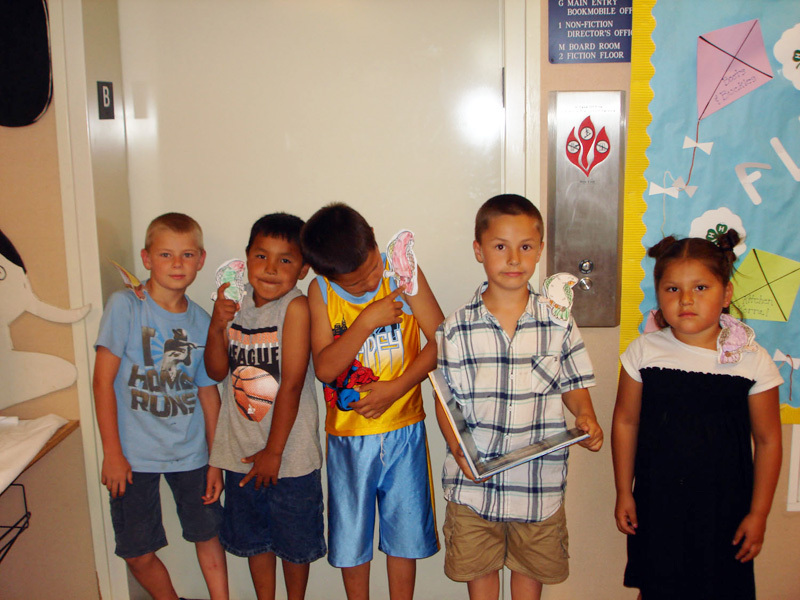 Some of the kids made hook fingers to add to their pirate look! 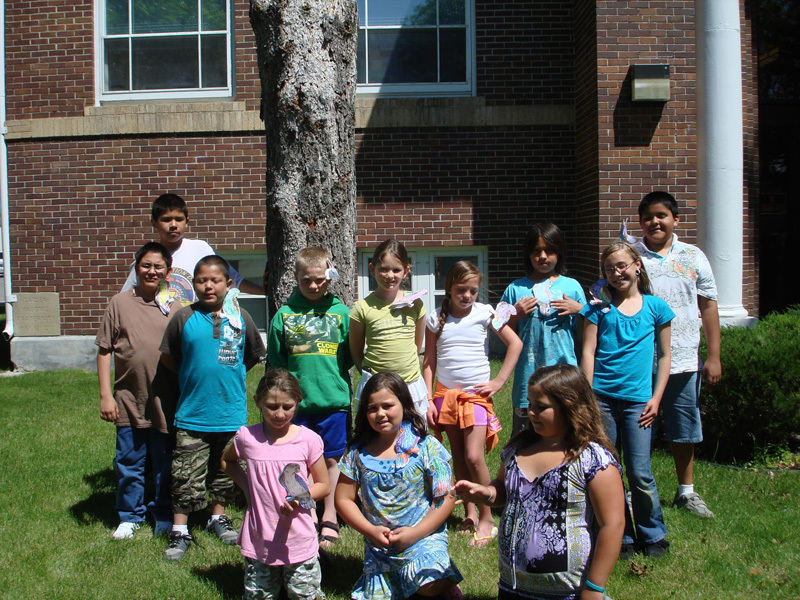 Instead of saying “Cheese” for the picture they all said “ARGH!”." 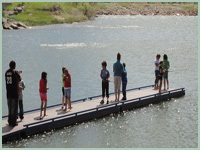 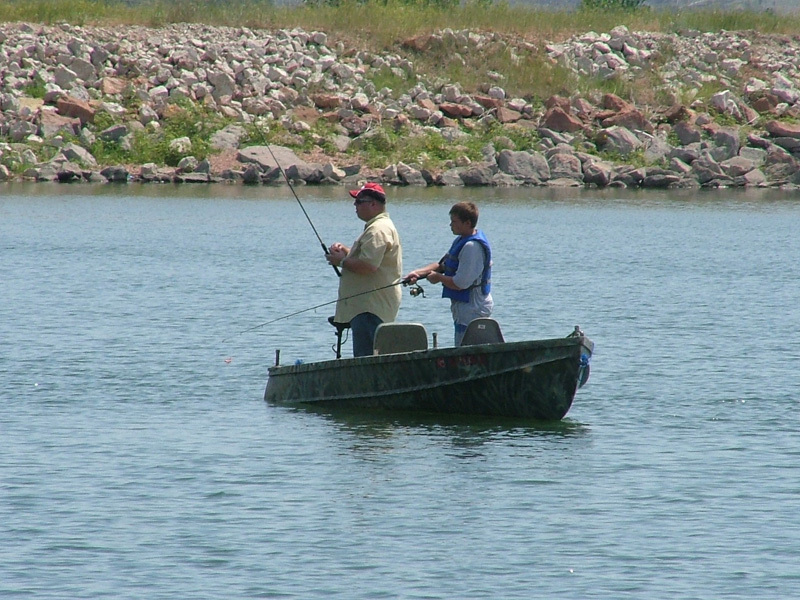 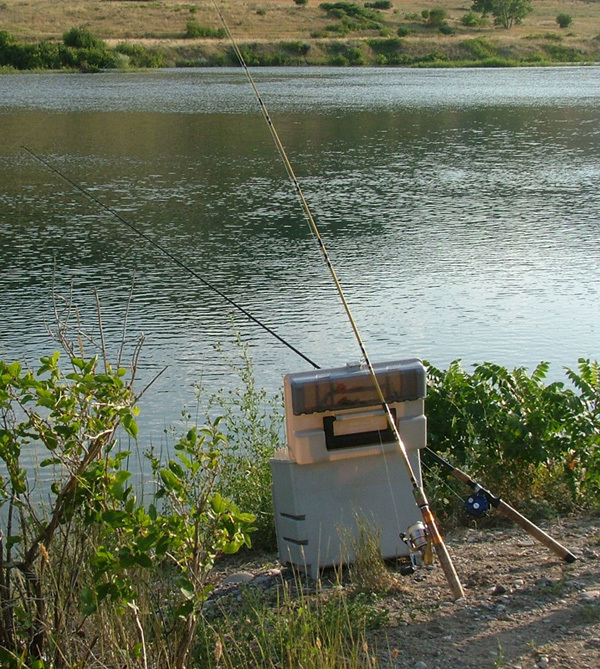 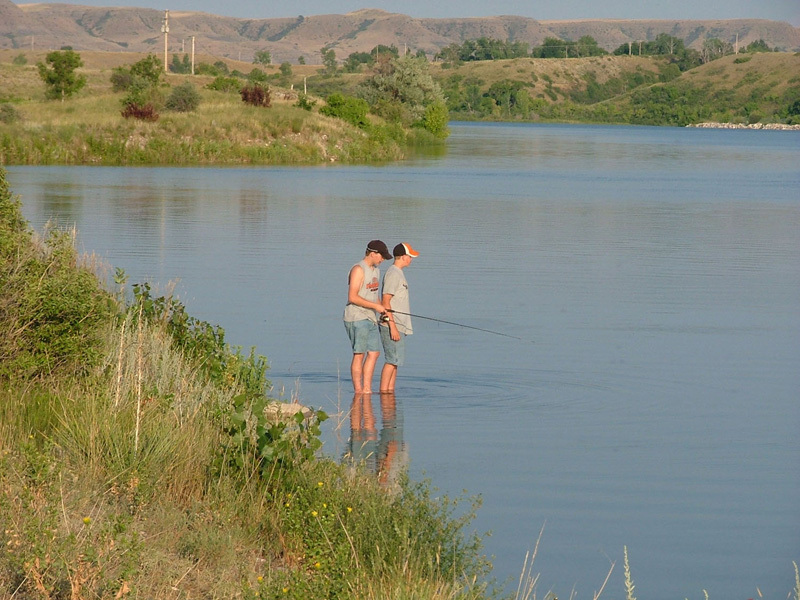 "We had our first fishing trip of the summer today, Friday, June 18th. 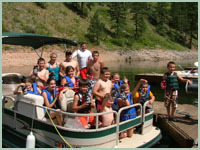 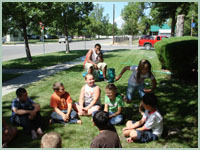 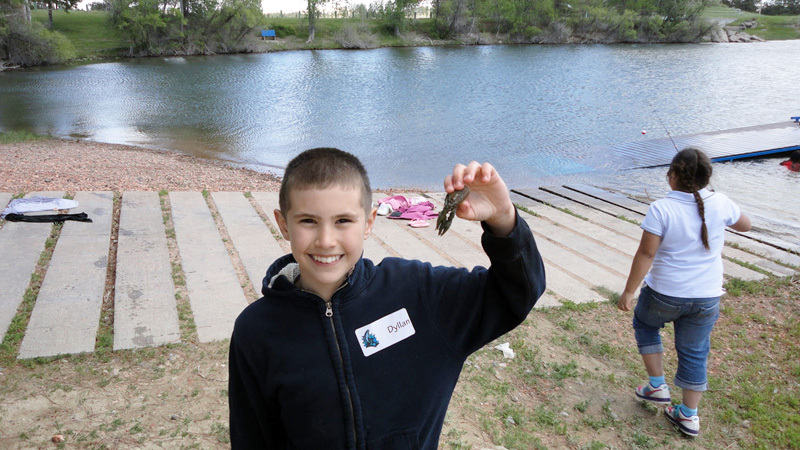 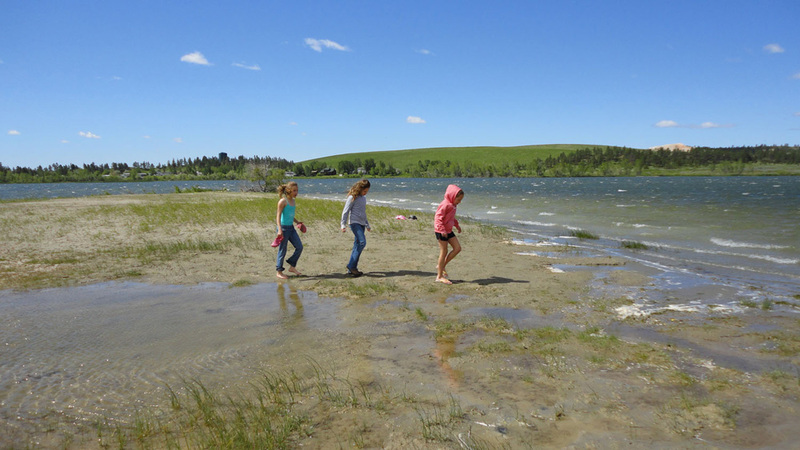 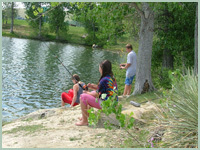 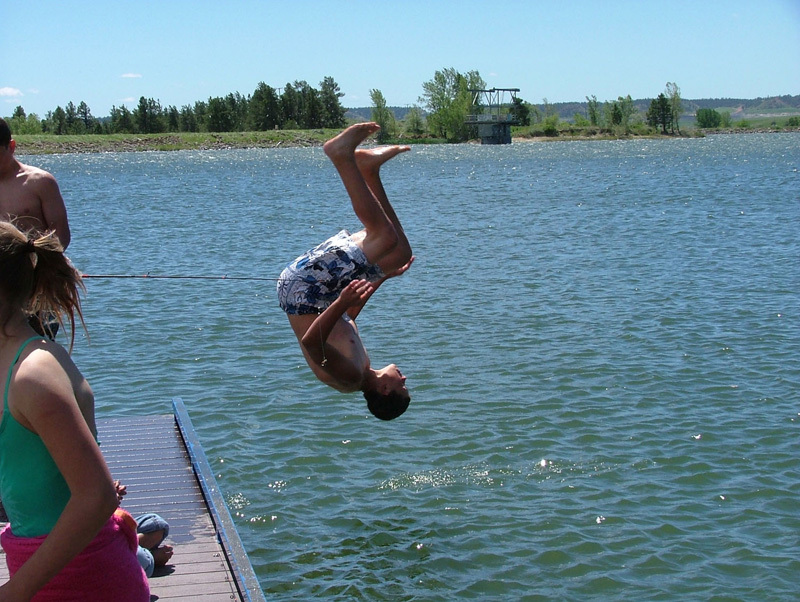 We took 15 kids (3rd – 6th graders) to Castle Rock Lake in Colstrip (MT). 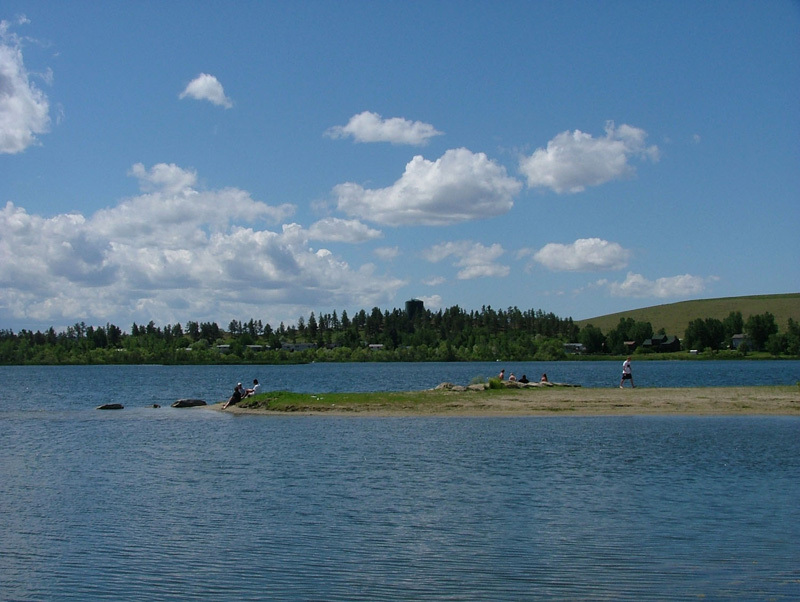 It would have been a great day for fishing and swimming except for the 40 mph winds. 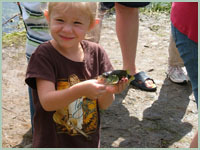 The kids didn’t seem to mind too much, there were quite a few that decided to look for, and catch quite a few crawdads. 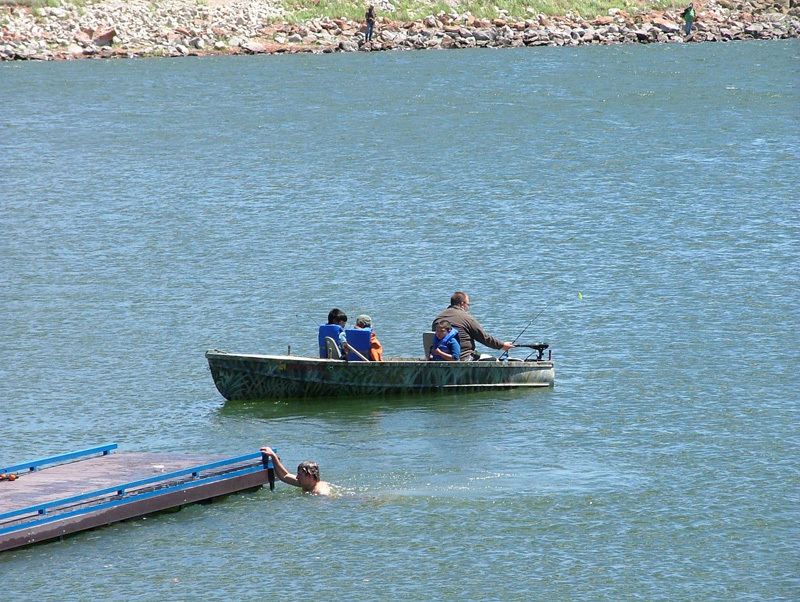 One fish was caught all day and a few brave people decided to swim anyway! 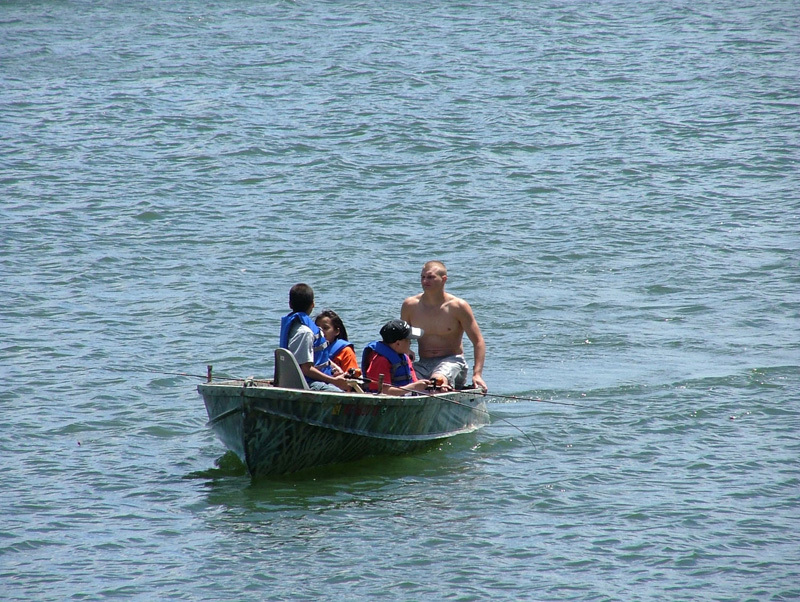 A few of our chaperones braved out on the boat a few times, so a few of the kids were able to go for a ride. 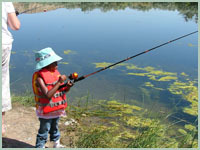 One little girl told me she had never been fishing before, even though she did not catch a fish she said it was still fun." 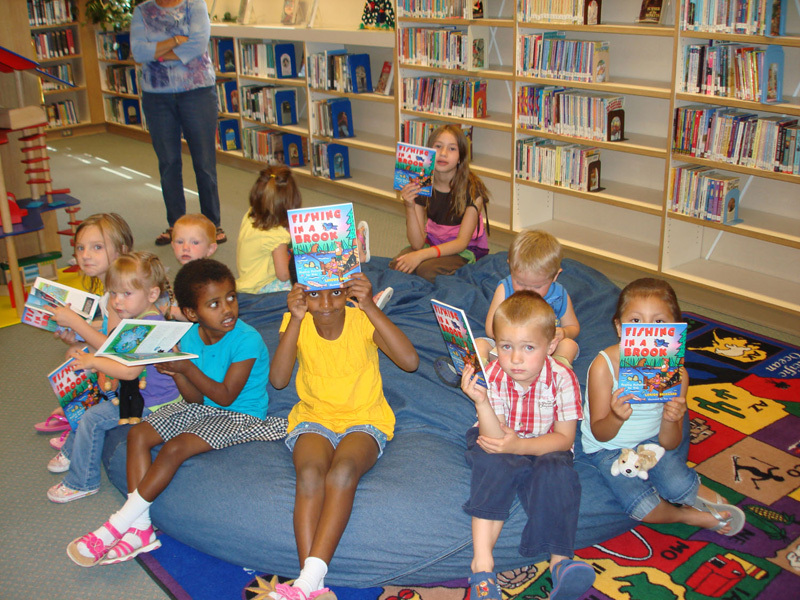 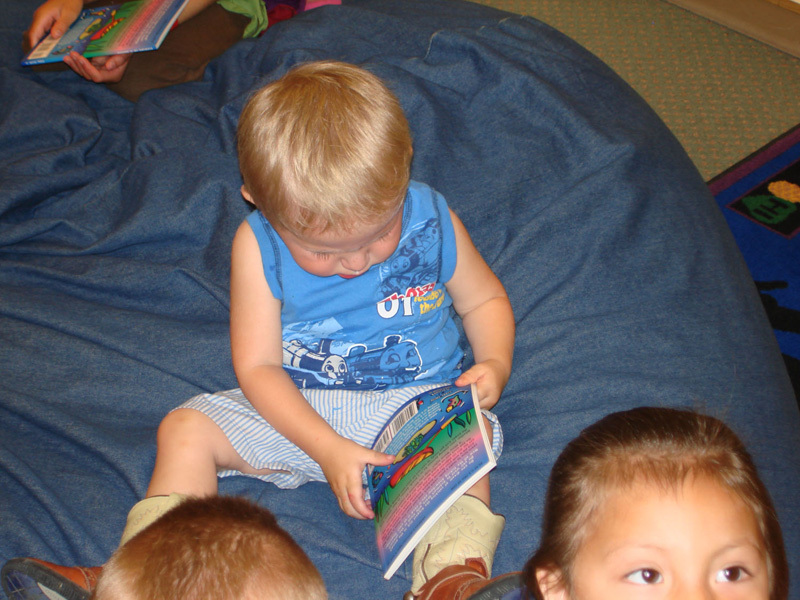 "Today, we had 10 preschoolers come and listen to the book “Who Sank The Boat”. 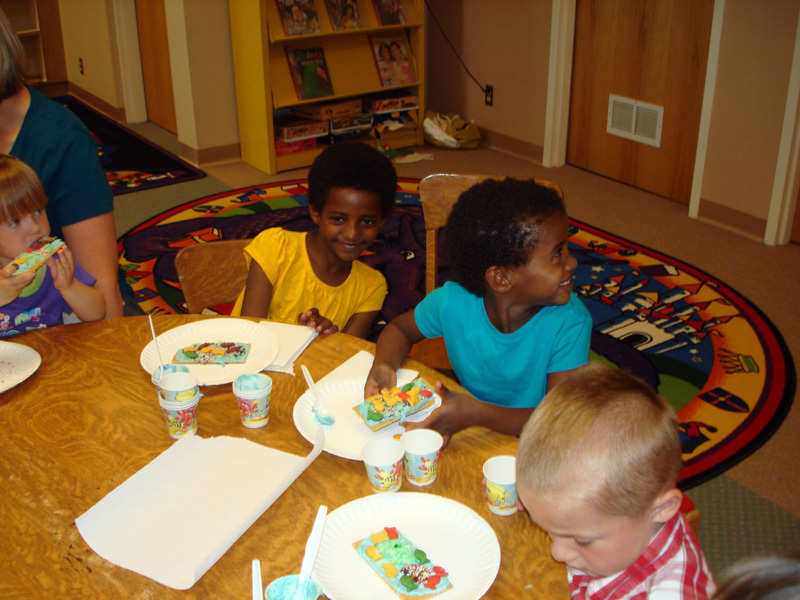 After the story they made edible aquariums and enjoyed the snack after their work was done"
"Here are some pictures from Tuesday’s Program with K – 2nd graders. 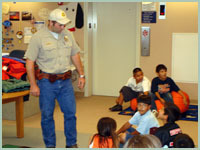 30 kids were in attendance. 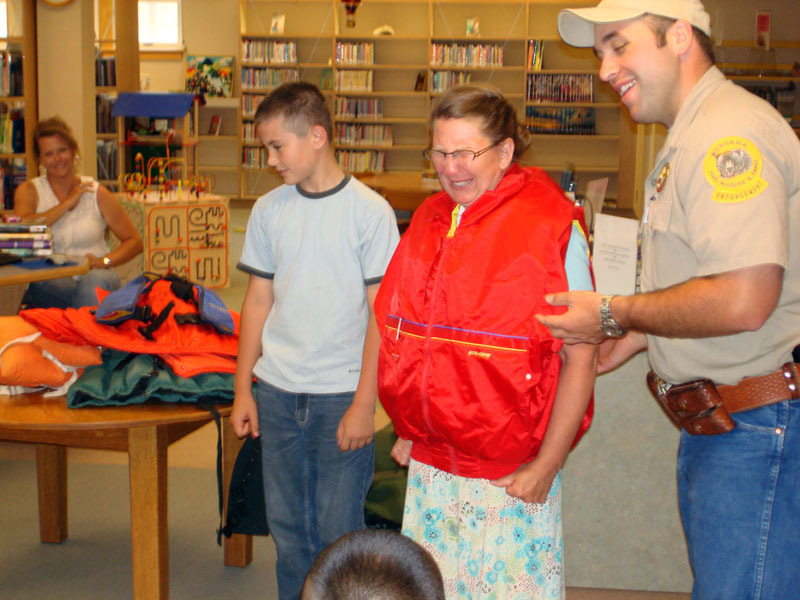 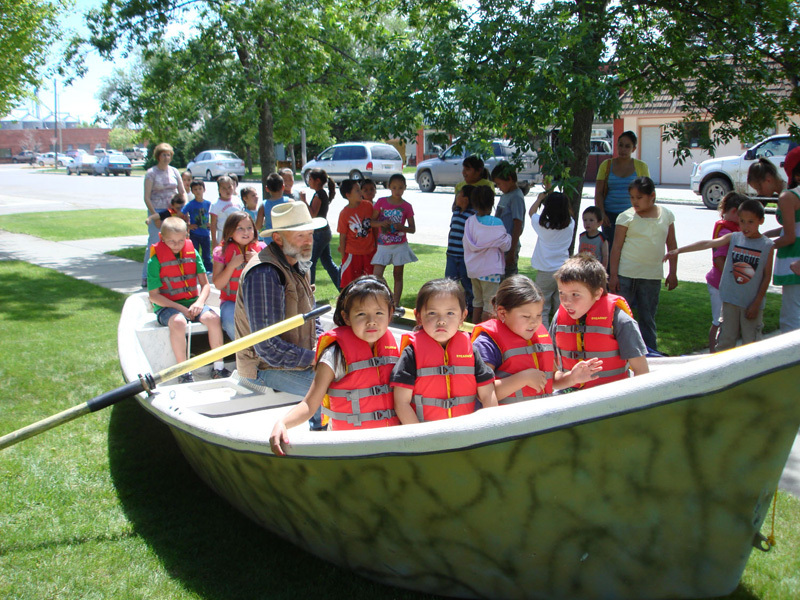 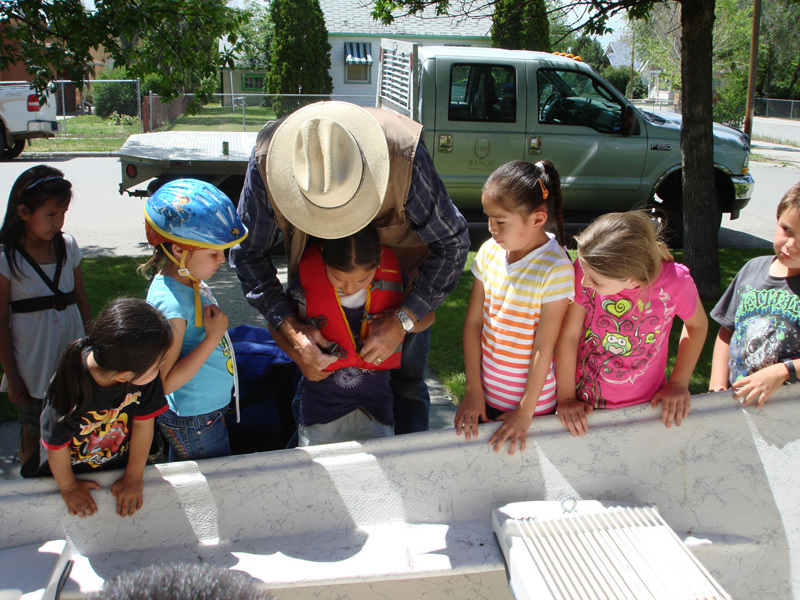 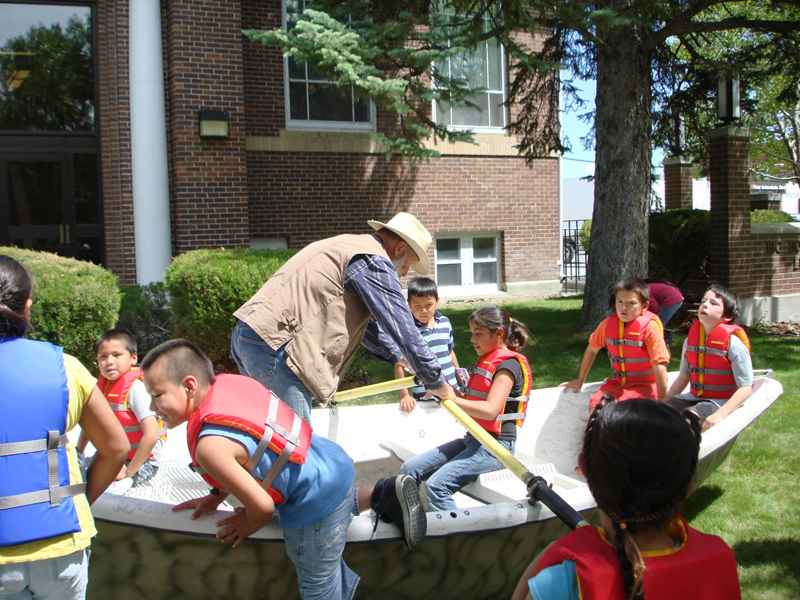 Chip Watts came in as a guest speaker to show the kids how to use life vests and showed them his river boat." 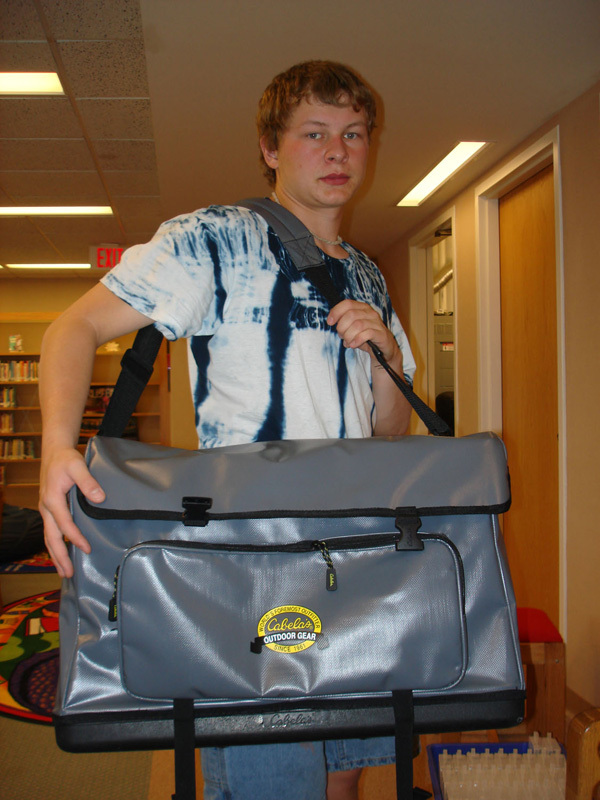 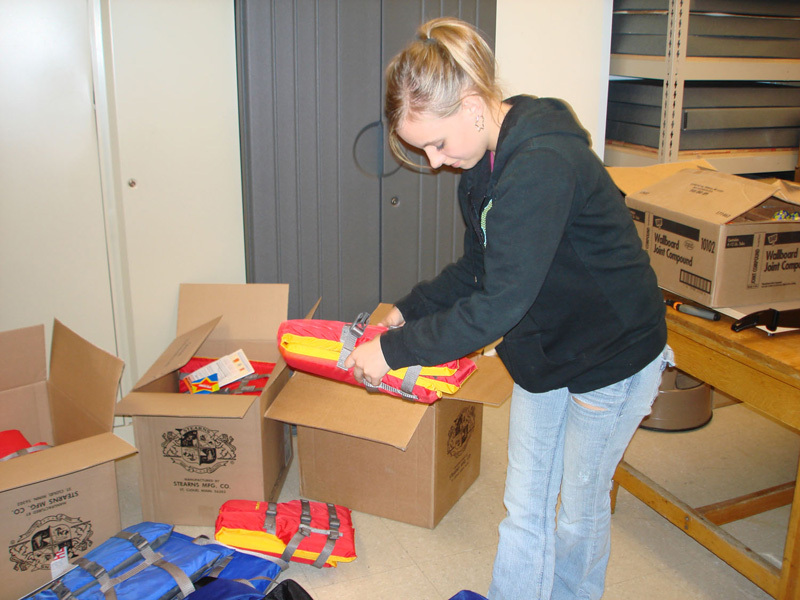 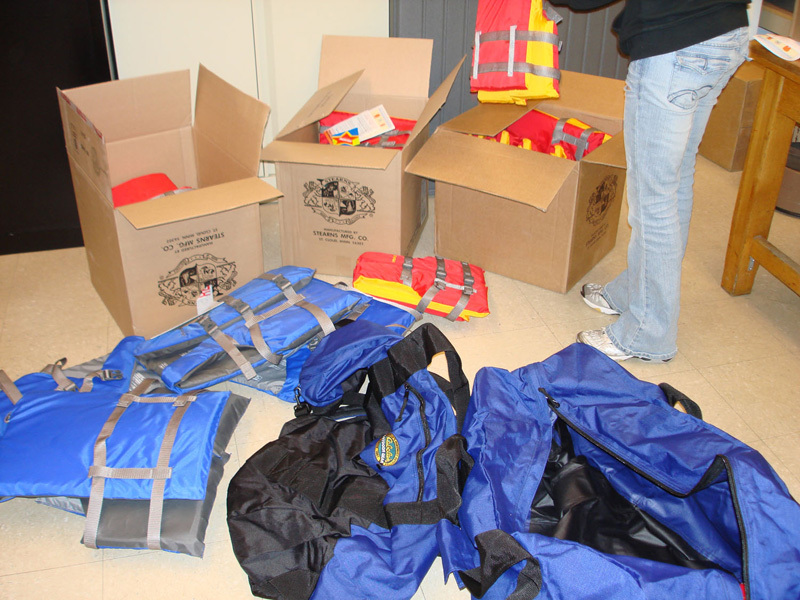 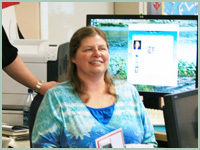 "With most supplies purchased, we were ready for the program to begin today. 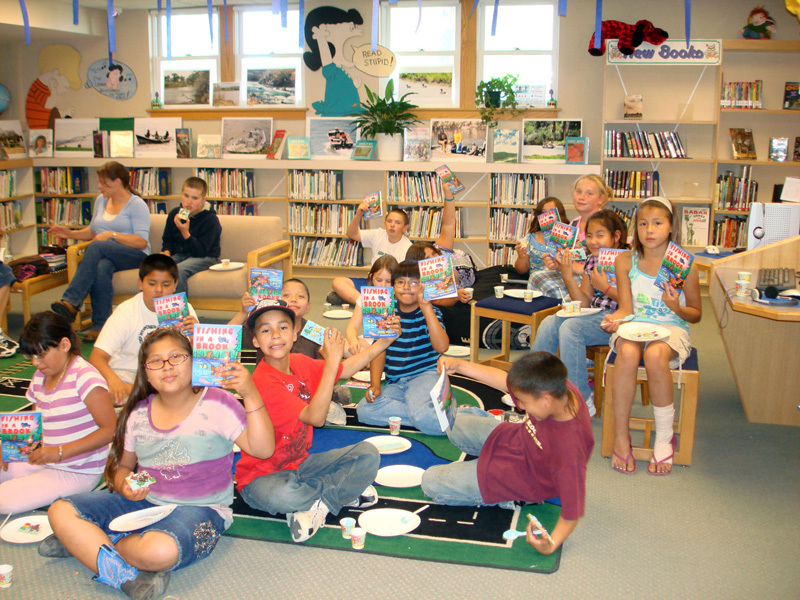 We had 24 kids 3rd - 6th grade for our first program. 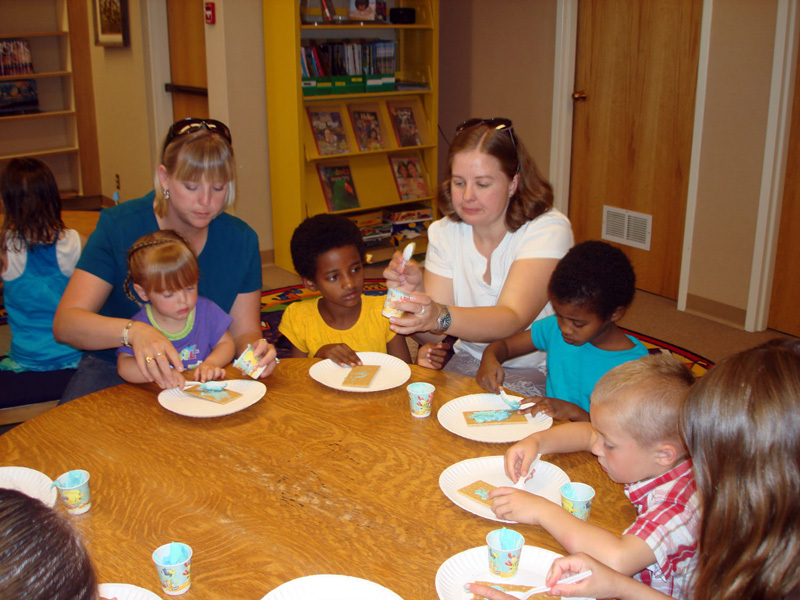 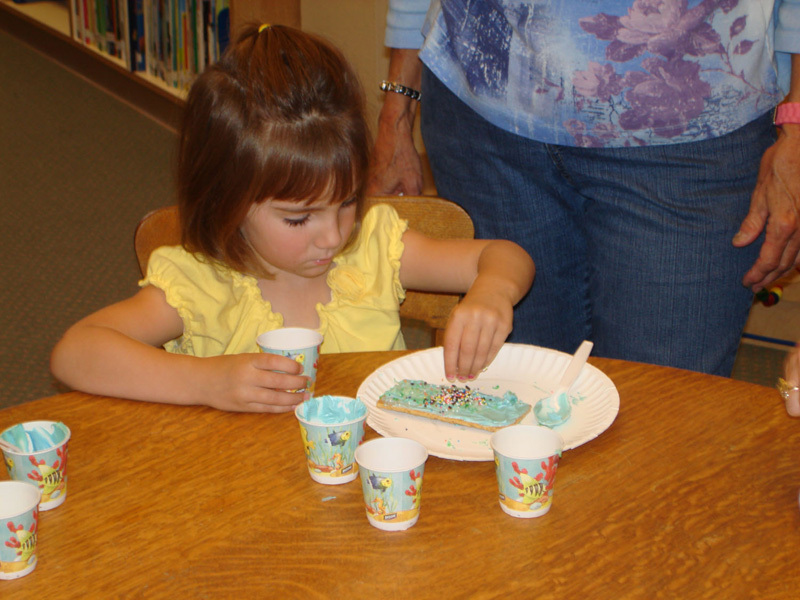 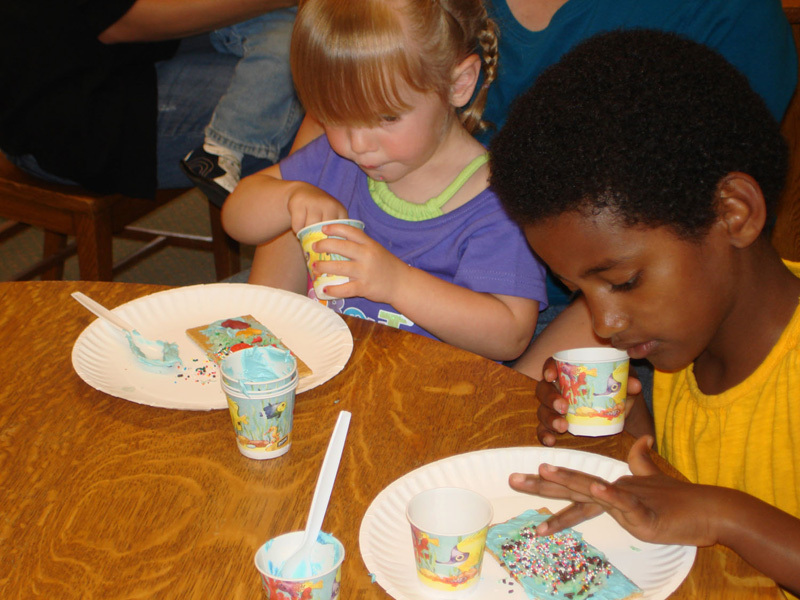 We read the book "Wish for a Fish" by Bonnie Worth then the kids made edible aquariums. 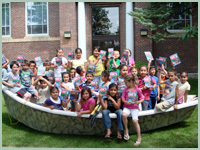 I gave each child in attendance a copy of the book "Fishing in a Brook". 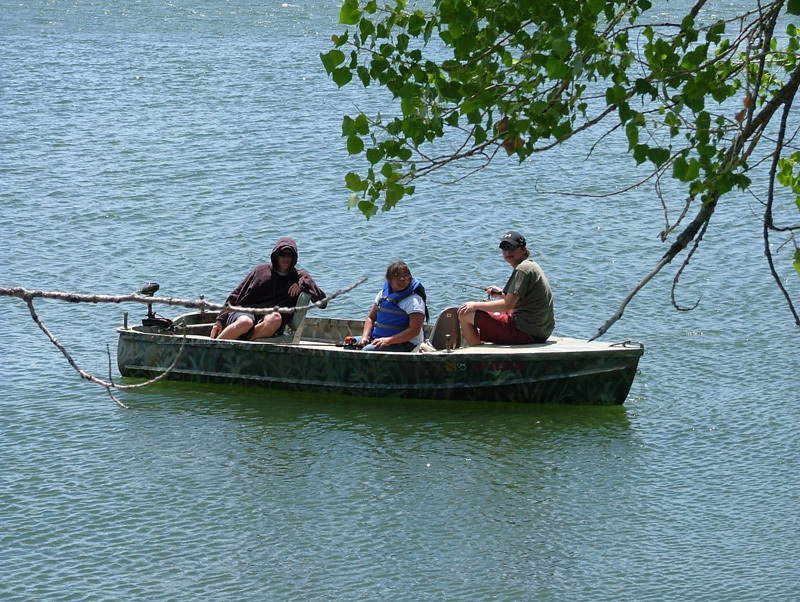 They were also surprised when I told them that we would be taking our first fishing trip for the summer this Friday. 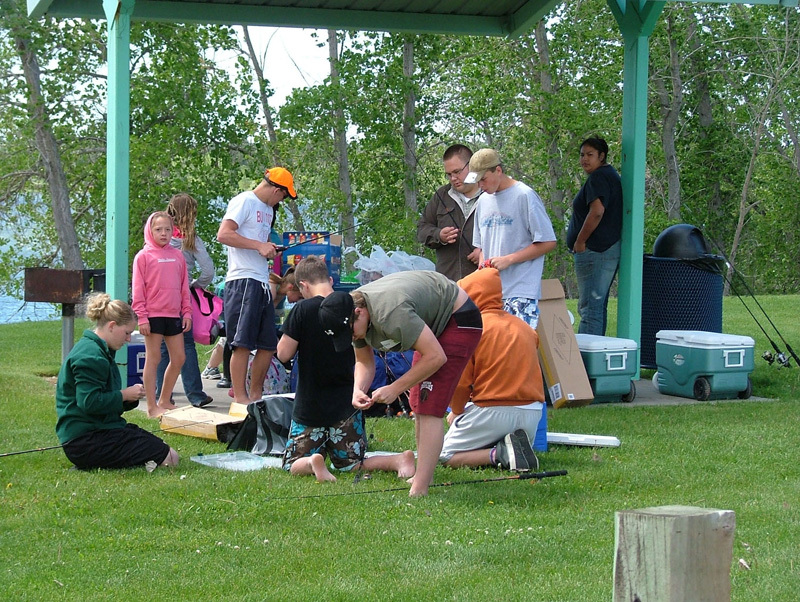 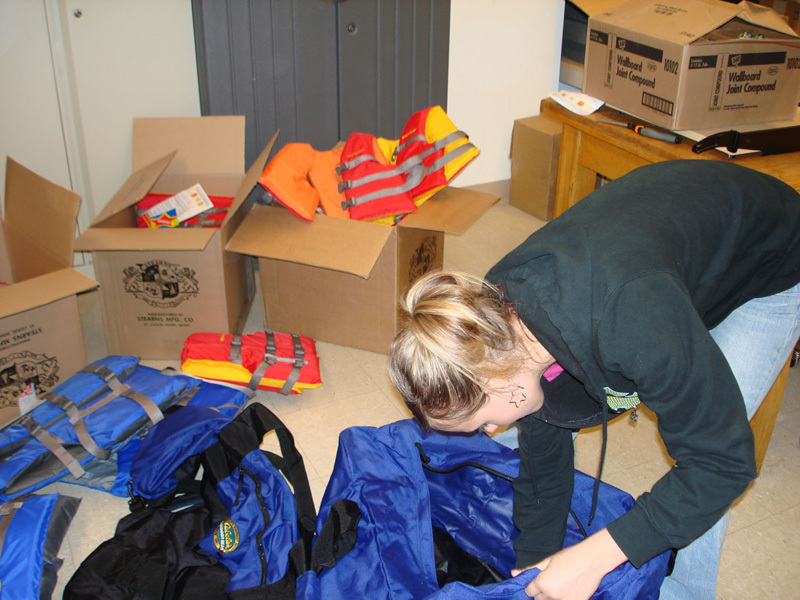 Below are a couple photos from today's program, along with photos of one of our youth workers, Shayla, getting ready all the life vests in the duffel bags, and my older son, Christopher, helping ready the tackle in the new tackle box." 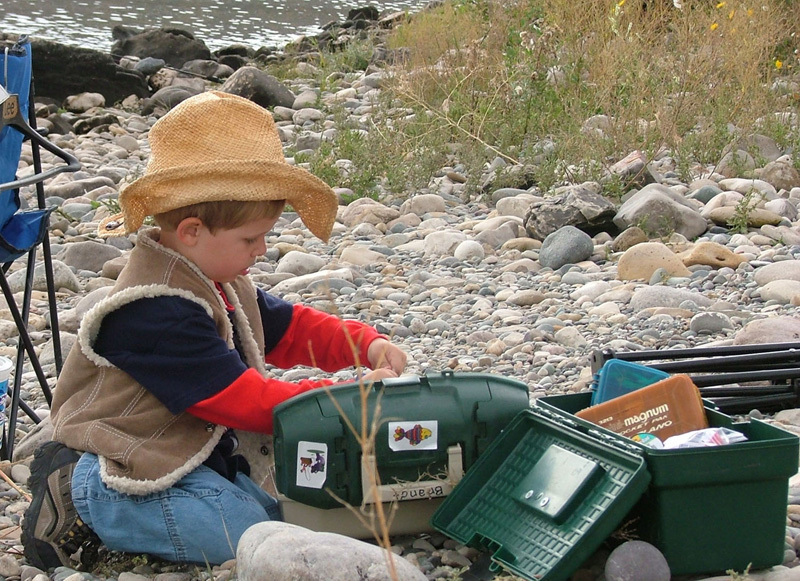 The fishing books arrived and Donelle's helpers (Kenny Woody and Cody Real Bird) opened the boxes as Donelle took pictures. 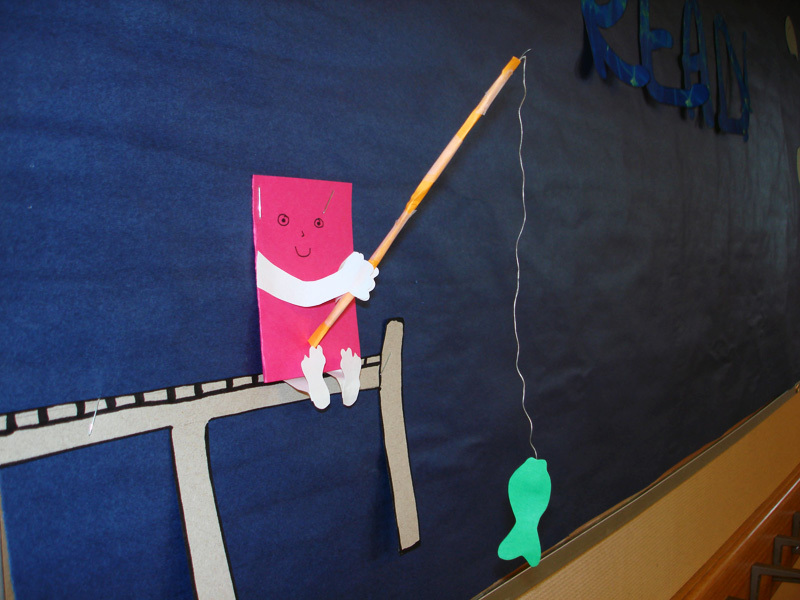 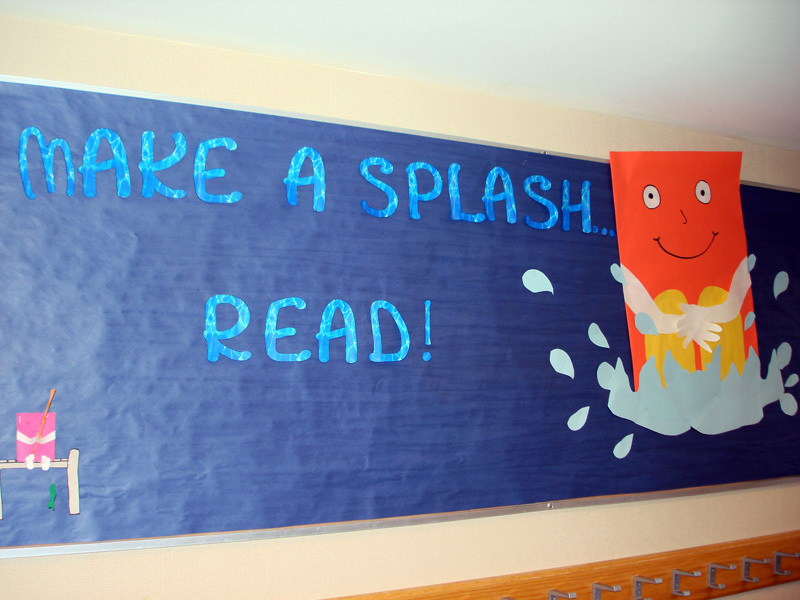 Donelle also sent us a couple photos of the bulletin board they put up to promote the MAKE A SPLASH, READ summer reading program. 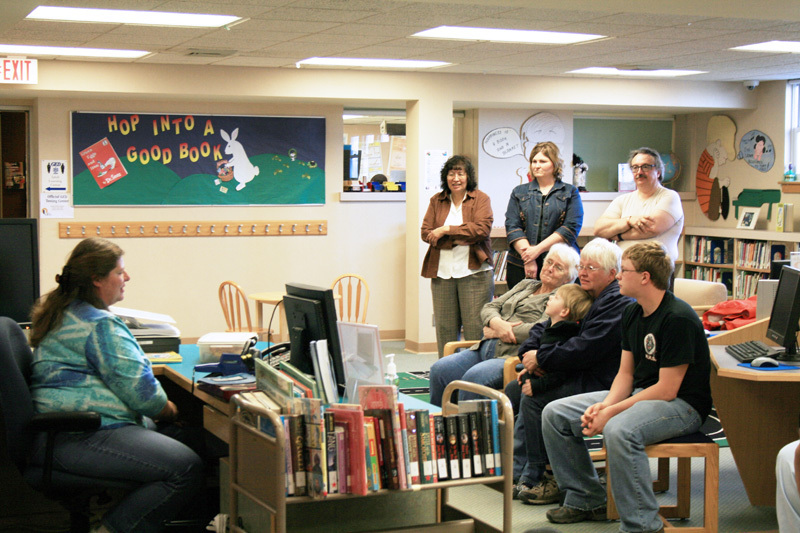 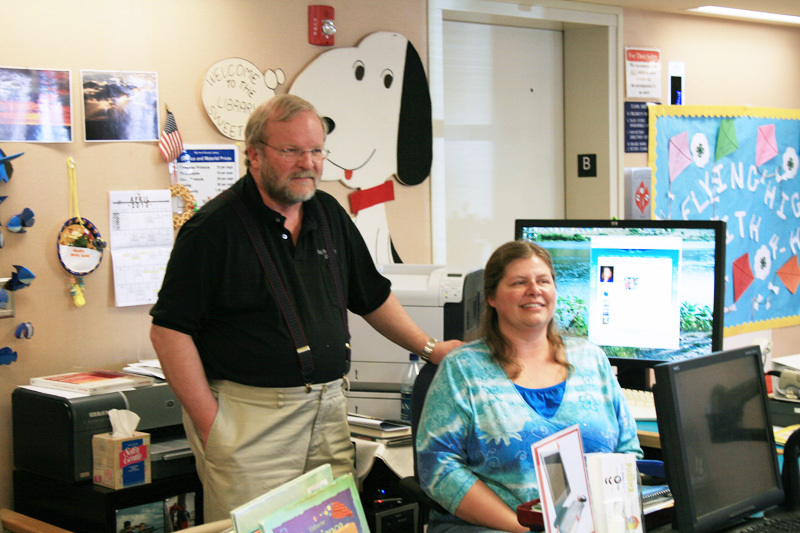 Donelle must have wondered why a small group was assembling around her desk at the library today but it was all set up by library director, Eric Halverson, in anticipation of my surprise phone call. 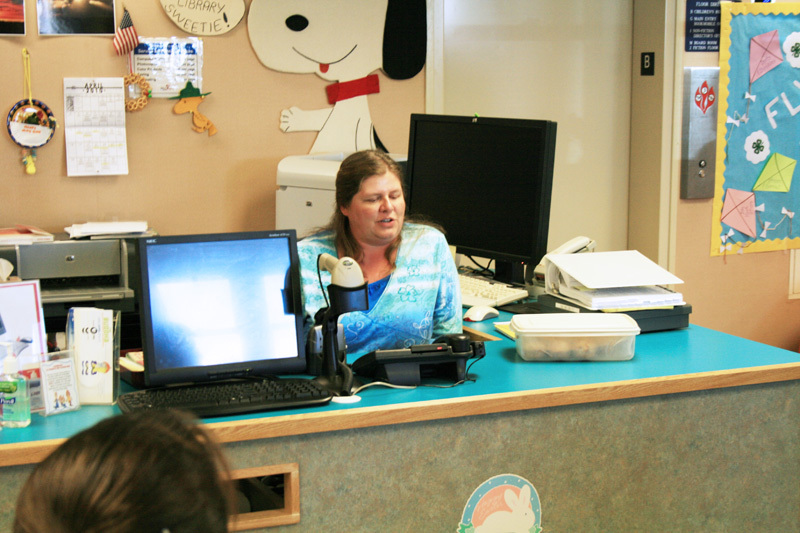 When Donelle answered the phone, she was surrounded by the library staff, county commissioners, her friends and even her 3-year-old nephew, Brock, along with their local newspaper reporter. 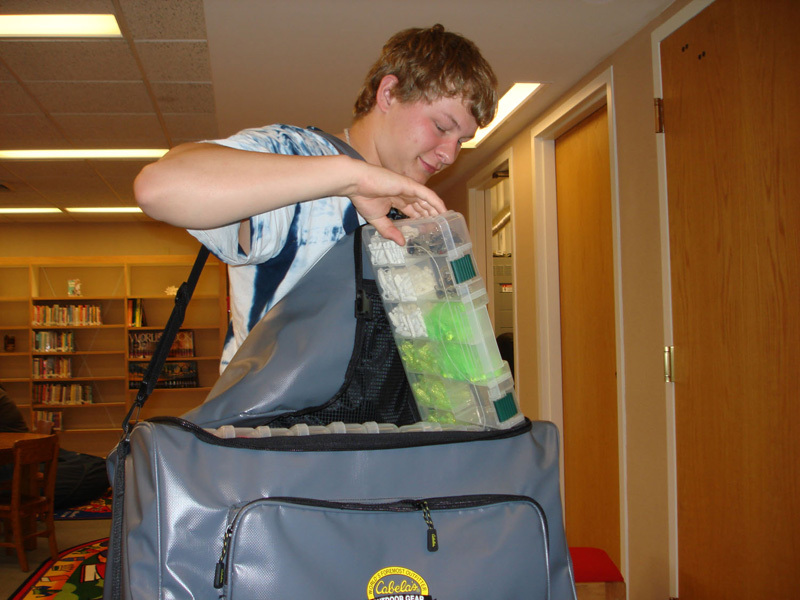 Eric even brought in some food for the "surprise committee." 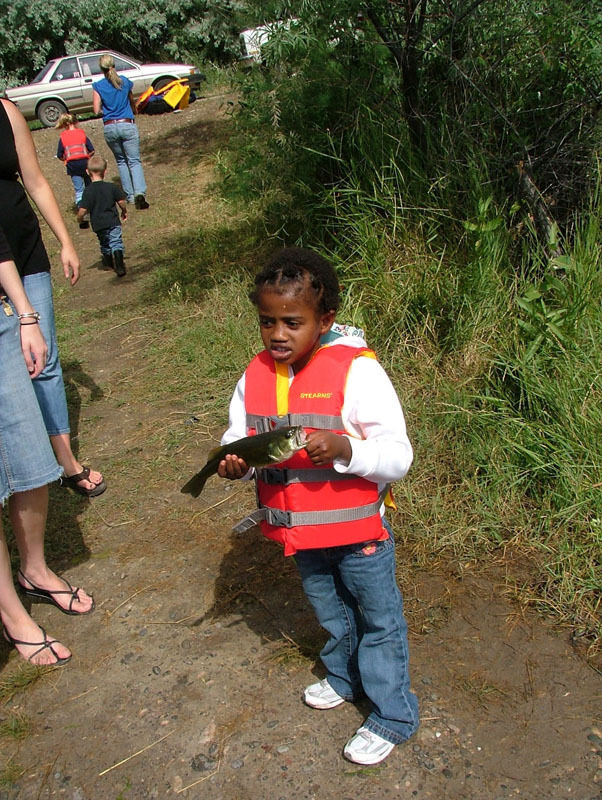 Donelle said she plans to take the kids in the program to different areas of the county, including fish hatcheries (she had to explain what those were to me - duh!) 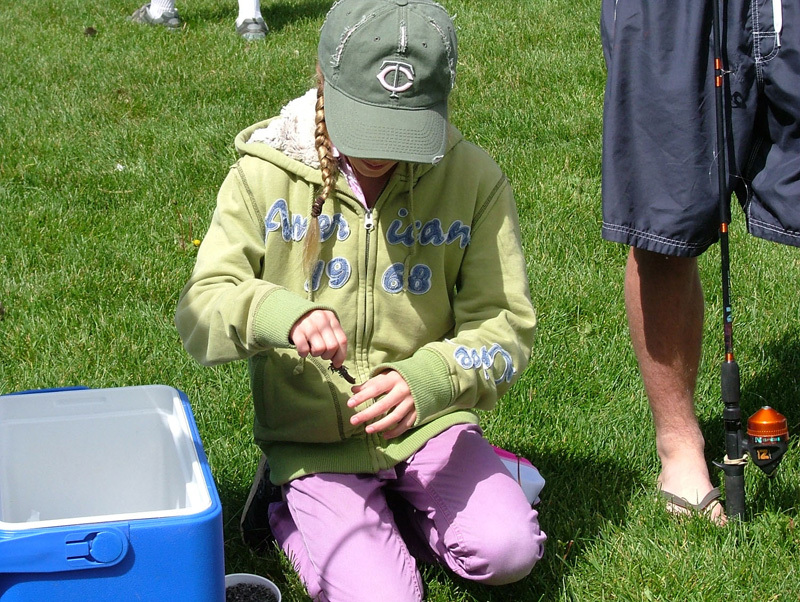 and I was surprised to know that oftentimes, there are more girls into fishing than boys. 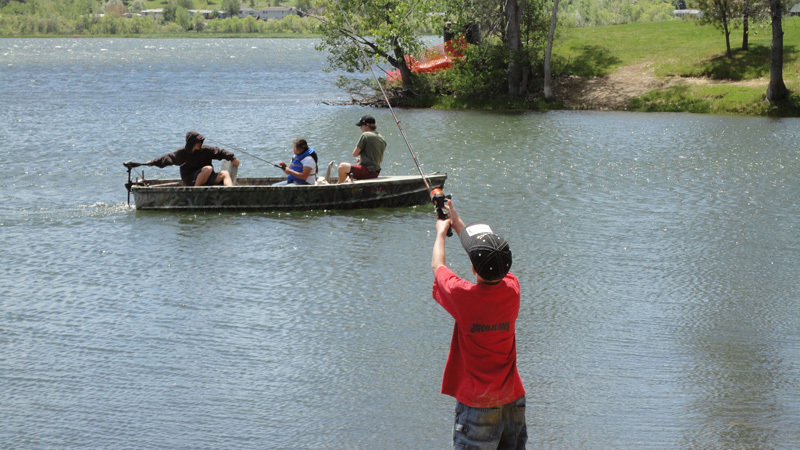 Everyone there sounded really excited about this program and we look forward to hearing some good fish stories. 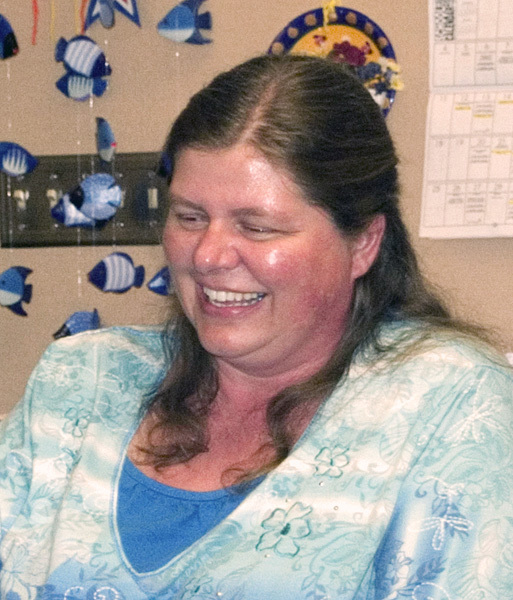 Donelle has two sons, Christopher in 11th grade, and Erik in 8th. 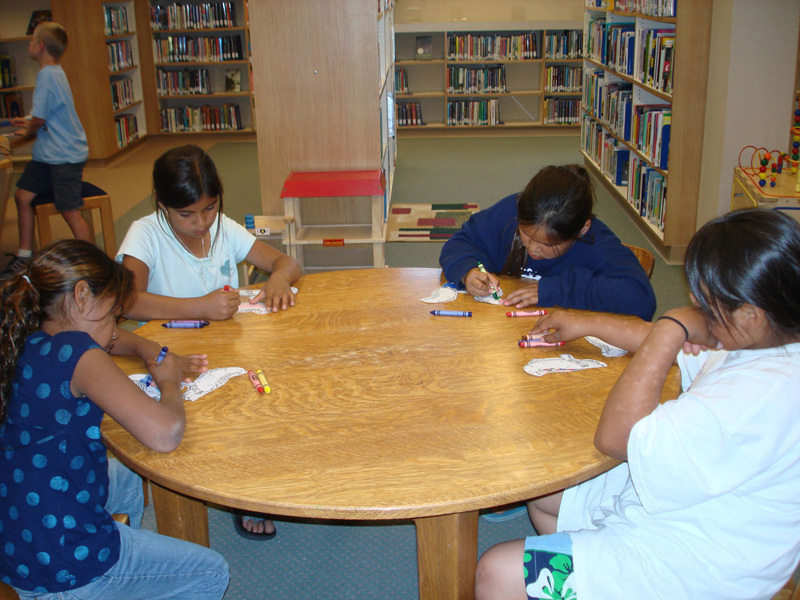 04/07/10: Jenny wrote... "Donelle, what a great idea! The kids are sure to love this fun and educational program and it will benefit the entire community. 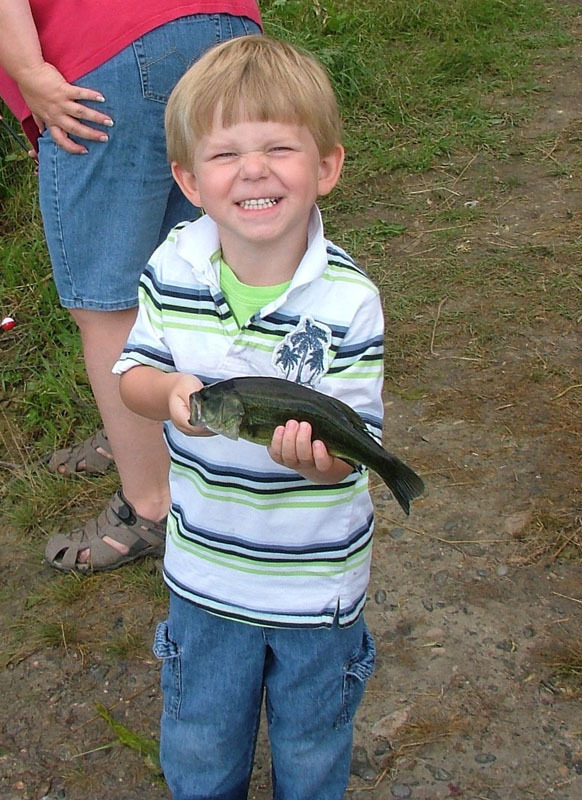 Hook one for me!" 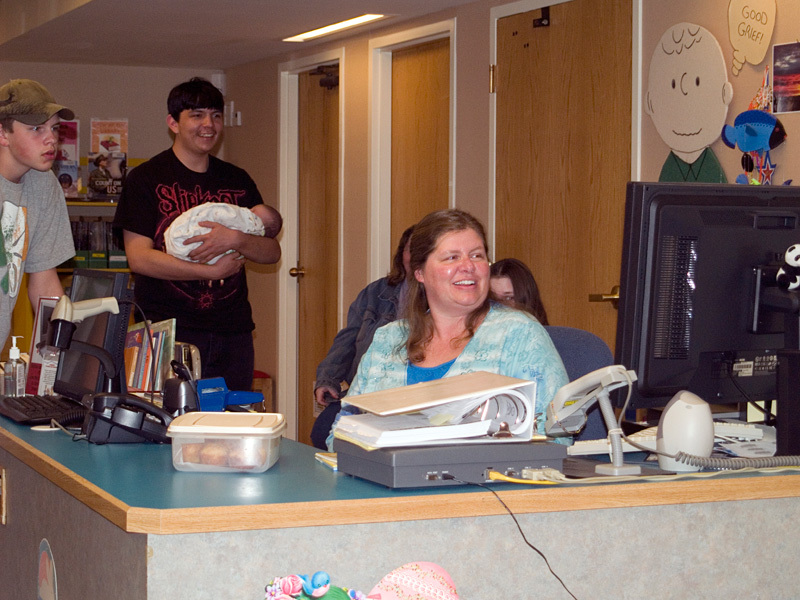 04/07/10: Damon wrote... "Congratulations, Donelle. 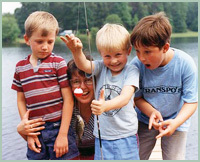 I did a lot of fishing growing up so I know the kids are going to love your summer reading program... Good luck with everything, and hope you catch lots of big ones."